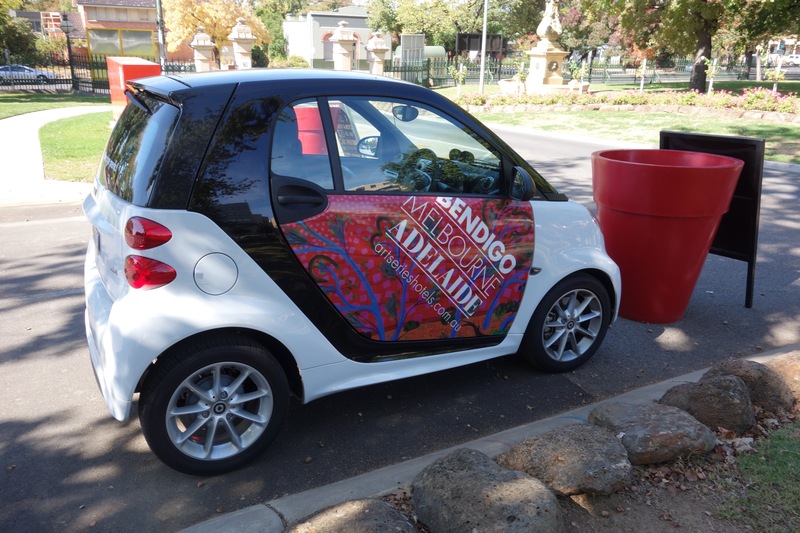 Posted on 08/06/2015	by John Pond, J.P.
After seeing the sign “To Bendigo” on our various trips to Melbourne, my wife and I decided a couple of nights in this historic town would be a great short break. Bendigo is about two hours drive along the Calder Highway from Melbourne. 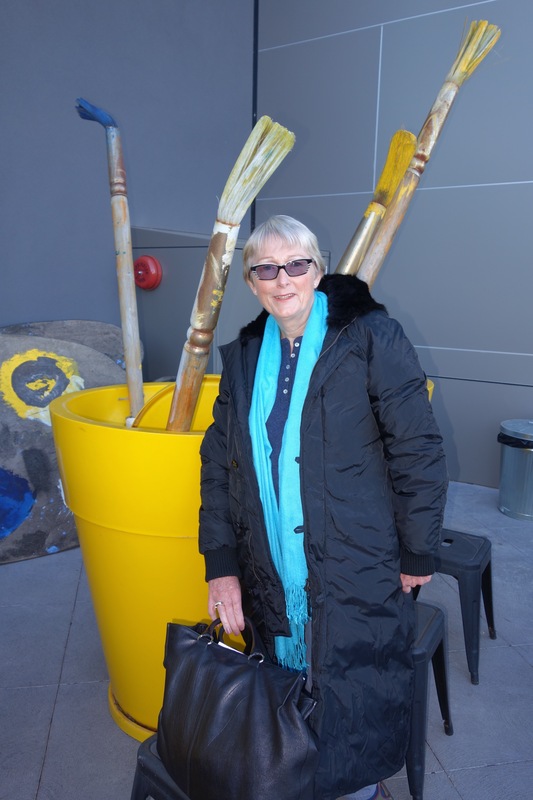 We did not want to take our car all the way from Sydney, so on flying into Melbourne we headed to the nearby “The Larwill”, part of the Art Series Hotel Group, to pick up our Smart Car. Apparently some of the Art Series hotels offer bicycles and Smart Cars at a very reasonable rate. We chose our Smart Car, a very “green” and compact vehicle, made by Mercedes from a selection parked outside the hotel. This compact car fitted my fairly large frame more than adequately and once I was made aware of all the controls by the hotel’s concierge, we were soon on our way to Bendigo, 152 km away. The car’s hire cost was a very reasonable $50 per day. On arrival in Bendigo at The Schaller Studio, we were checked in by a very delightful front office person and preceded to our room, which was certainly different from the normal hotel style. I would describe it as modern funky, whatever that means. Anyhow, we two seniors enjoyed the vibe, and our room had all the comforts we look for in a hotel. A substantial continental breakfast was included and during the day, snacks, coffee and cakes were available for purchase. Purported to be the number one hotel in town, it is situated right next to the town’s hospital. The hotel is recently built and has all the modern features one would expect in a 4 star property. The staff went out of their way to please, with that true “Aussie country” hospitality. In the hotel’s foyer, there were several comfortable lounge areas where one could sit, have a coffee and just enjoy the multitude of artworks and sculptures. As a bonus, there was a large outdoor seating area. The Schaller Studio takes its name from Australian artist Mark Schaller whose works can be seen throughout the hotel. Car parking is complimentary. The hotel is located 2.5 km from the Bendigo train station and 1.5 km to the town centre. There is so much to do in historic Bendigo, the Art Gallery is a must. In walking around this beautiful town one can clearly see where much of the money from the famous gold rush era went. The town’s gardens with their floral display are a pleasure to walk through. We certainly enjoyed every minute of our hotel stay and the joys of Bendigo. Posted on 09/02/2015	by John Pond, J.P. 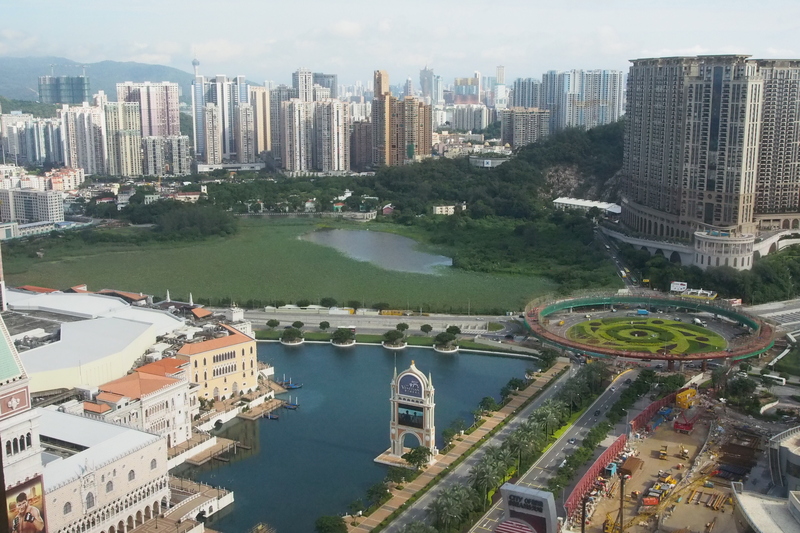 When visiting Hong Kong, whether on business or pleasure, I always endeavour to allow two or more days to go to Macau, a less than 60 minute journey from either Hong Kong or Hong Kong Airport by jet ferry. Although I am not a gambler, I find Macau to be a real jewel, with some of the best hotels and restaurants in the world. 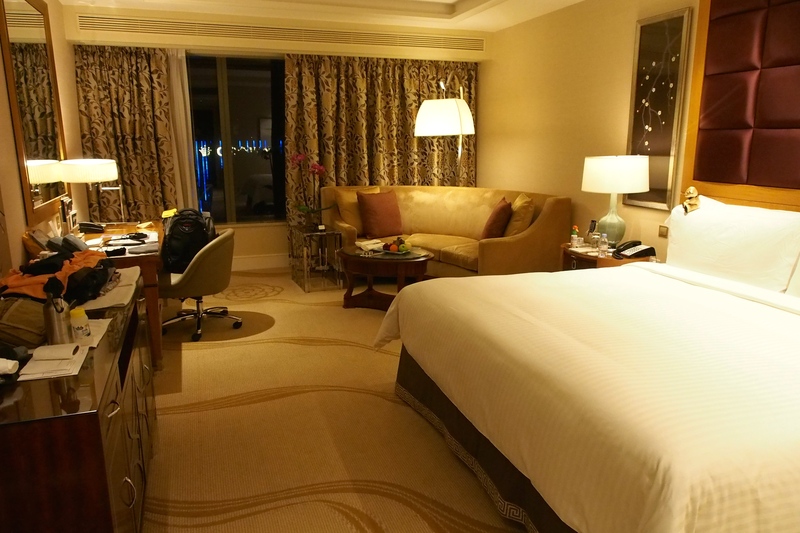 On this trip I chose to stay at the Conrad Macau Cotai Central. This is certainly one of the finest hotels in this ex Portuguese territory. I love a good 5 star hotel with a choice of restaurants, lounges and facilities and Conrad Macau ticks all the boxes for me. Our room, a King Deluxe on a high floor overlooked most of Macau and one could see the many additional new hotels springing up in all directions. After a very efficient check in we were shown to our very spacious room, complete with a very comfortable curved lounge and an enormous bathroom that my wife loved. Every major hotel chain that one would see in Las Vegas is either there or under construction. Macau, money wise, brings in seven times the gaming revenue of Las Vegas, as a result, we see no expense spared in providing first class construction and facilities, not to forget the most excellent service that one almost expects, as standard. During the two days we spent at Conrad sampling all the dining experiences they had to offer, we had nothing to complain about. Our day started with breakfast in the Grand Orbit International Buffet, offering perhaps the largest selection of breakfast fare we have encountered. 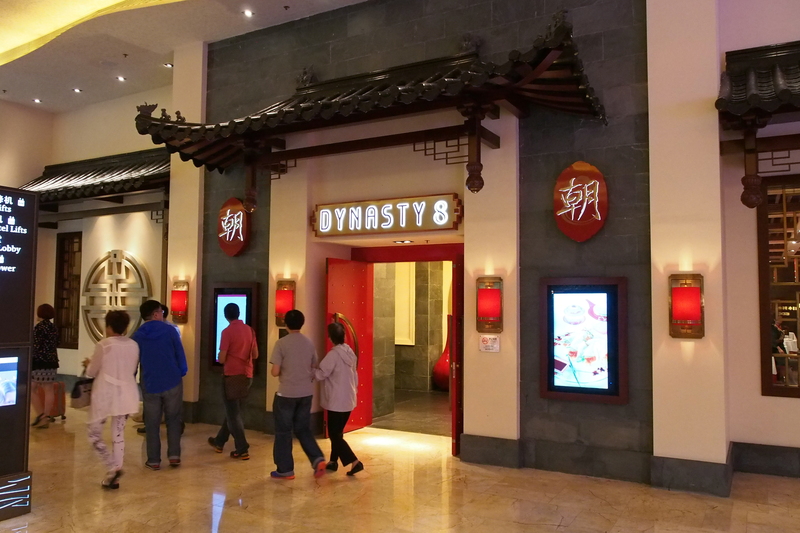 Dynasty 8, their elegant Chinese restaurant inspired by the eight Chinese Dynasties, served exceptional Asian dishes, I wished I was staying longer so I could experience more of their menu. When we needed some time just to relax “The Lounge” fitted the bill, one could watch the passing parade while enjoying a high tea (a must). Each evening my wife and I enjoyed cocktails there, especially the martinis. For those wanting a light meal, there was an extensive menu. Prices throughout the hotel were generally, in my opinion, surprising modest, thanks to the gambling. It’s nice to know gamblers were most probably subsidizing our culinary enjoyment. In the hotel there is a huge courtyard garden where characters from “Shrek” appear at set times, to the delight of children and those young at heart. This is a great photo opportunity, so don’t forget to bring your camera. For those that want a flutter in the casino, naturally Conrad has all one could wish for in their world class gaming palace. Most hotels in Macau are linked through a network of shopping arcades where every international brand and more can be found. If one is a petite size there is certainly no problem in finding something to fit, but for those approaching king size, like myself, one may be restricted to buying non clothing items. 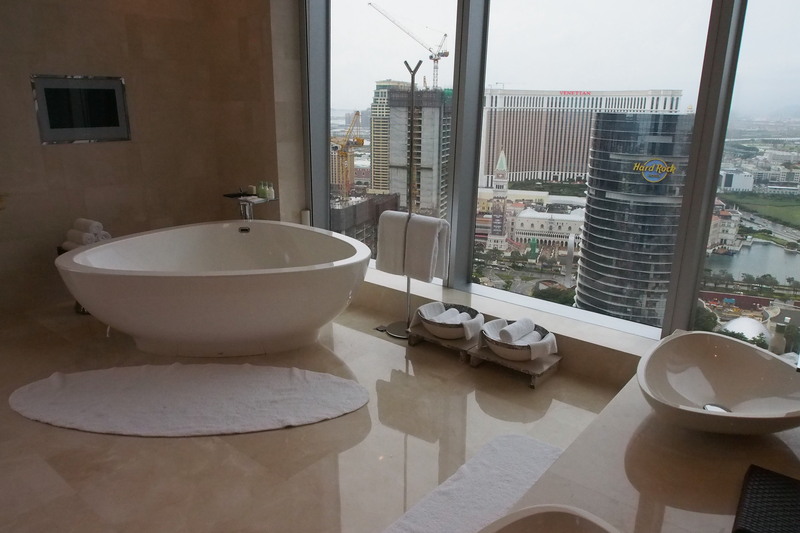 Conrad Macau exceeded all our expectations. Posted on 11/01/2015	by John Pond, J.P.
My wife Sandra and I wanted to recharge our batteries at a health spa not too far from Sydney, so after a 2 hour drive we arrived in Bundanoon home of Solar Springs Retreat. Here is mainly her review. Giving up all the things you enjoy and adhering to strict diets is no fun, neither is boot camp style exercising, so to get back into shape requires a venue that allows you to choose your own pace. I made it my mission to find a place where an exercise averse and comfort loving person, such as myself, would enjoy spending a few days to renew. After doing some research, I discovered Solar Springs Health Retreat. They offer two to seven night packages that are designed to indulge and inspire. This sounded just the sort of place that would cater to my needs. Situated in the Southern Highlands town of Bundanoon, a quaint village that takes you back to yesteryear, it’s an easy two hour drive down the highway from Sydney. If driving does not appeal, catch the train to Bundanoon and Solar Springs will pick you up from the station. I felt a sense of grandeur as I proceeded up the driveway, flanked by huge trees, to the main building, a former 1920’s Guest House. 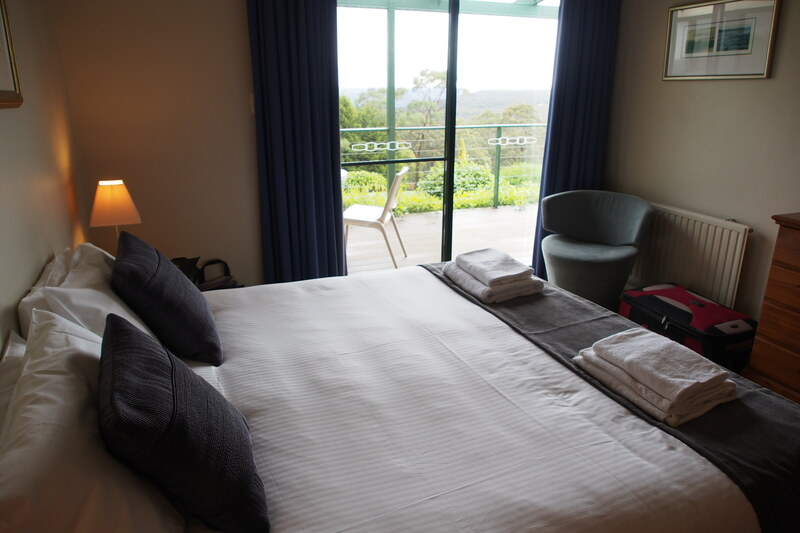 Set amidst beautiful park like gardens and situated on the escarpment overlooking Morton National Park, I thought this tranquil setting was indeed the right choice for me to begin my renewal. From our room, overlooking the gardens, I was able to watch the arrival of kangaroos, rosellas, cockatoos, galahs and ducks each morning and evening. To help me in my quest to regain my fitness levels, the daily programme offered a wide choice of activities including archery, aquarobics, bushwalks, yoga, gym classes, as well as specialised lectures from a life coach and a naturopath. The enormous indoor pool, with a bubbling spa at one end, was a great place to relax and get some exercise at the same time. The tennis court, where I enjoyed a game or two, was also a welcome diversion from my magazine reading. I must confess that my favourite activities were the spa treatments. I enjoyed a very relaxing facial one morning, then in the afternoon I indulged in a full body massage. From the five facials available, I chose the “Solar Steam Infusion Facial” using papaya enzymes. Male guests are not forgotten, with the “Solar Men’s”, a special 55 minute facial for men only. My Swedish massage was just what I needed to get rid of the tension in my shoulders. There were so many other beauty treatments available, apart from the facials and massages, I could have spent my entire stay in the spa. Although there was not a wide choice, the food was excellent. For those watching their weight, there is not the temptation of multi-course menus and groaning buffet tables, such as one sees on cruise ships. Don’t expect 5 star accommodations. Rooms are basic many have great panoramic views, Not all have their own bathrooms. The grounds are certainly 5 star. 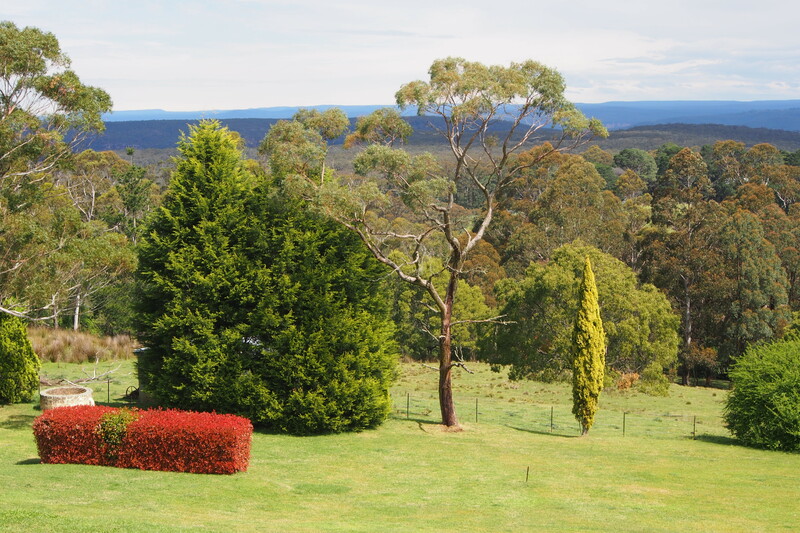 Solar Springs Health Retreat is situated on the escarpment of the Morton National Park in the picturesque village of Bundanoon, in the beautiful Southern Highlands. 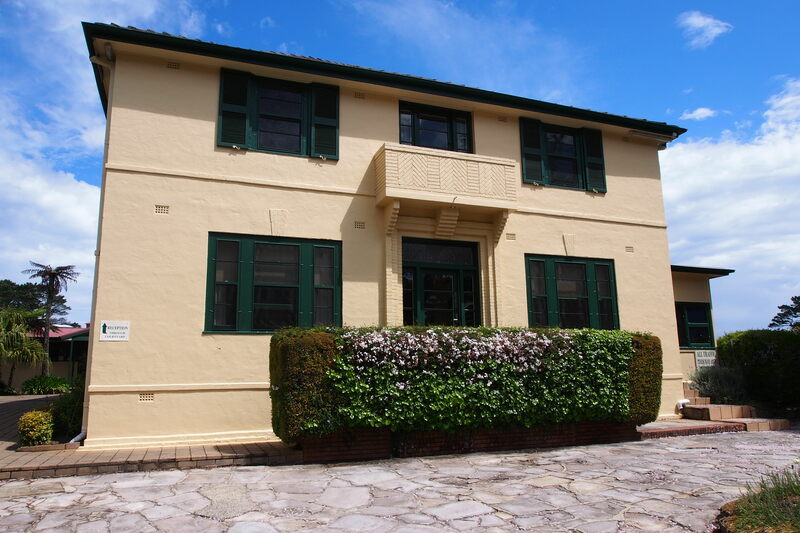 situated just 1 and a half to 2 hours south-west of Sydney. Posted on 10/01/2015	by John Pond, J.P.
Why Macau? Gambling, shopping, eating and sightseeing, it has so much to offer, with its Portuguese heritage not completely destroyed. Not many realise that the gaming drop is approximately seven times greater than Las Vegas, making it the most affluent gaming mecca in the world. Though not a gambler, I always endeavour to include Macau on any visit to Hong Kong. On this trip, my wife and I chose to stay at the 5 star Grand Hyatt Macau. 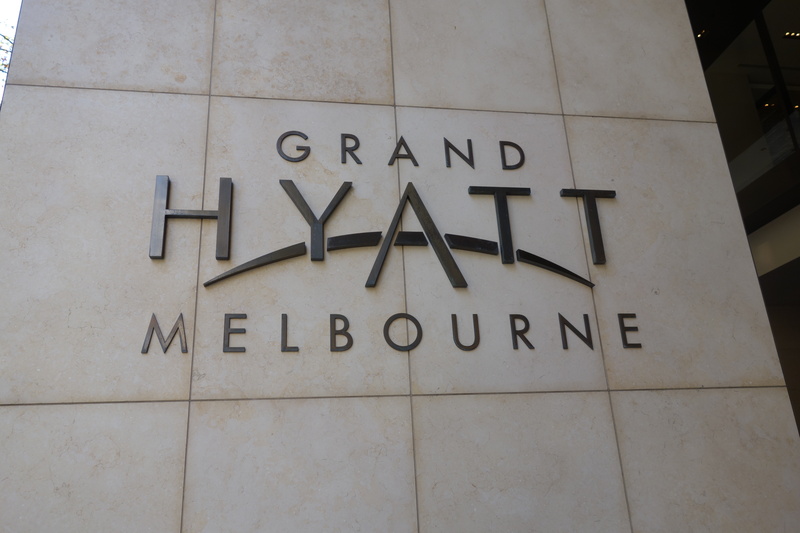 We were new to this property but are big fans of Grand Hyatt and this hotel is certainly that – Grand. As always with Grand Hyatt, we chose to stay on a Club Floor, where many extra luxuries are afforded. Apart from sweeping views of the whole area, the Club Lounge offers comfortable seating, a great place to relax, read or send emails, although the whole hotel is wired for wi fi. We really enjoyed our breakfast there each morning from the buffet that offered both eastern and western specialties, or if we chose, we could order a la carte. 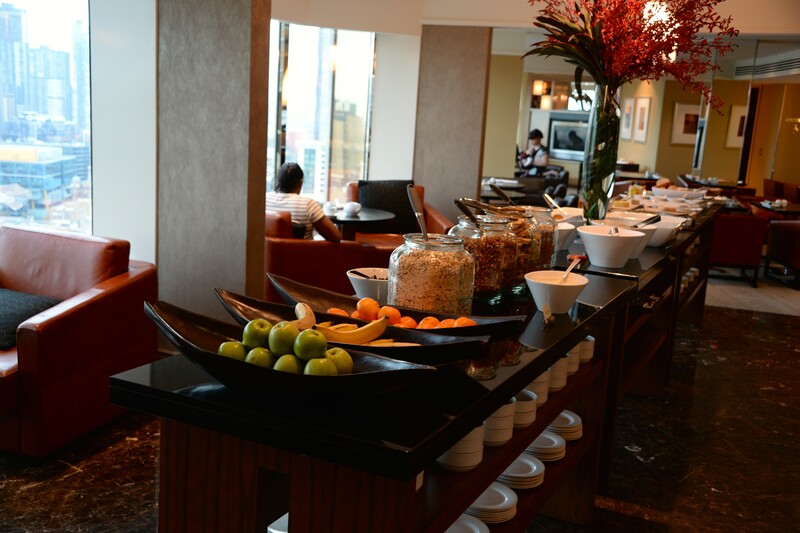 The Club Lounge is open from early to late and serves snacks, tea, coffee and soft drinks throughout the day. From early evening complimentary wines, spirits, beers and cocktails are served for a couple of hours, along with accompanying bar snacks. The Club Lounge, available to Club Floor guests, is worth every penny of the slightly additional room cost. The staff seemed to know your name almost immediately and go out of their way to please. Our deluxe Club Floor room, was very spacious, with lots of cupboards, two sinks in the bathroom, which is always a plus and naturally spotless. A bonus was having a separate lounge and bar area where I could watch TV in comfort and leave my wife in peace. The views, especially at night, were spectacular, with many new construction sites dotting the skyline. Naturally the Grand Hyatt possessed all of the amenities one would expect in a five star hotel. We especially enjoyed their most excellent Isala Spa where my wife and I had, probably, the best massage ever. On our arrival we were impressed by the incredible flower arrangements in the foyer that changed daily. 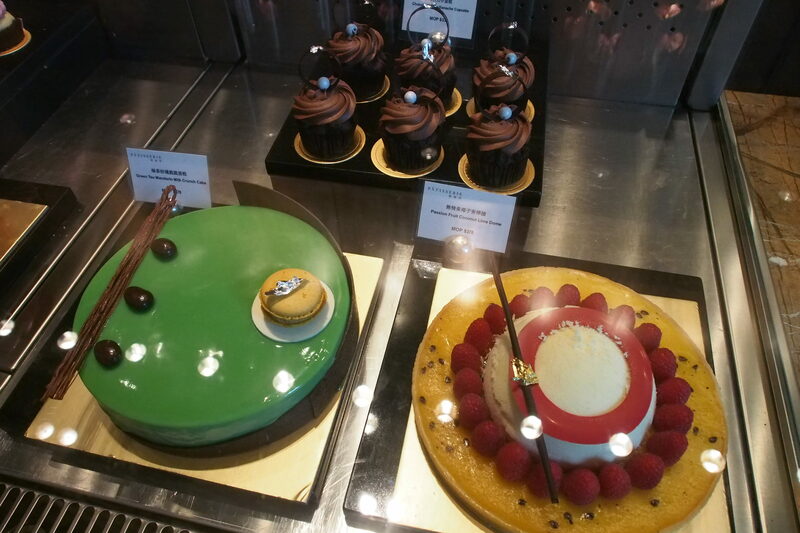 There was a coffee lounge/bar also in the foyer that had a selection of cakes that were impossible to pass. Live entertainment here throughout the evening was popular with both locals and guests. The Beijing Kitchen offered international fare but specialised in some outstanding Asian cuisine and was very much our favourite. 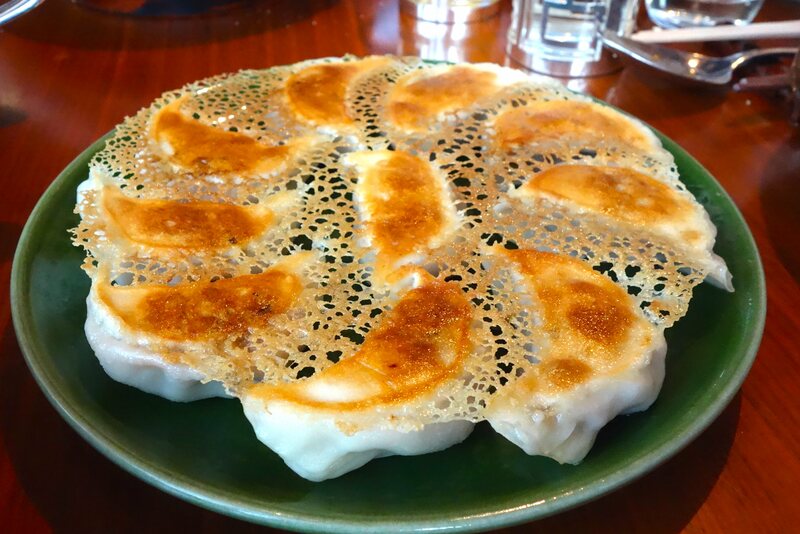 We love Asian food and found all their dishes and service exceptional. We also enjoyed an excellent dinner in their other restaurant, mezza9 macau, which served a wide selection of dishes and featured an outdoor terrace. Our only mistake was not having enough time in Macau. Due to the fact that the hotel had so much to offer, we rarely left its confines. Next trip we will certainly plan to spend more time there. The complex known as City of Dreams consists of three hotels, including Grand Hyatt Macau, are all linked via a series of shopping arcades. The complex also houses the main entertainment theatre presenting The House of Dancing Water. This unique show that cost over $250 million to produce is the ultimate in entertainment. The show appeals to all age groups and is a must see. I would suggest booking well in advance via internet. 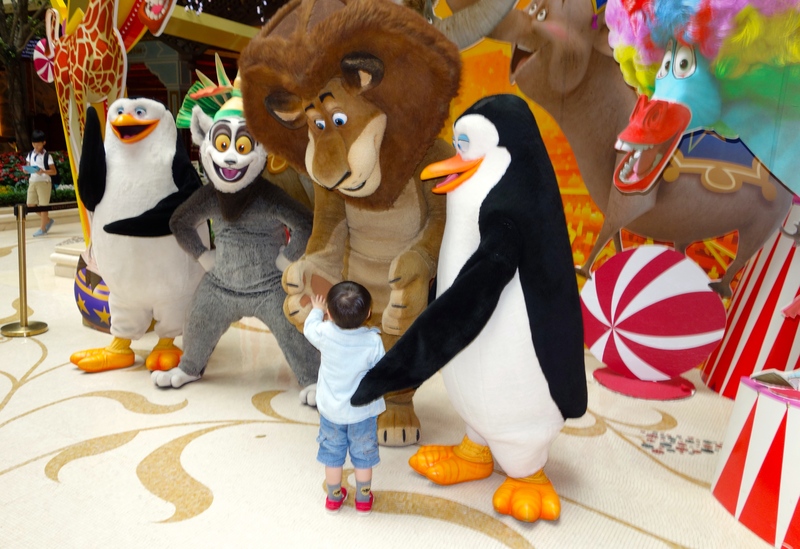 To sum up, Macau has something for everyone and staying at the Grand Hyatt made our short stay even more special. Macau is less than one hour Turbo Jet ride from Hong Kong and can also be accessed directly from Hong Kong International Airport. Posted on 19/10/2014	by John Pond, J.P. Location, location, that’s what this hotel is all about. Situated in the very heart of downtown Melbourne, this Collins Street hotel is perfect for the business traveler or those who come to Melbourne to shop. My wife and I chose this hotel for its location, literally a two minute walk away for a formal evening event we were to attend. We had no need for a taxi. As we were only staying two nights and not on vacation, we chose a more basic room, but on our favourite Club Floor, which gave us access to all the delights associated with a Club Room. Our room was smaller than we are normally used to, but had all the amenities that one could wish for. Again, let me stress, one of the great beauties of most Hyatt Hotels is access to Club Floor facilities. We really took advantage of their Club Lounge, situated at the very top of this high rise hotel, with sweeping views across Melbourne. Their breakfast buffet offered substantial hot and cold fare, with some dishes being cooked to order. The Club Lounge is open all day till late and from early evening alcoholic beverages, cocktails and canapés may be enjoyed while watching the sun set. Actually the food is exceptional, and one may easily skip dinner. 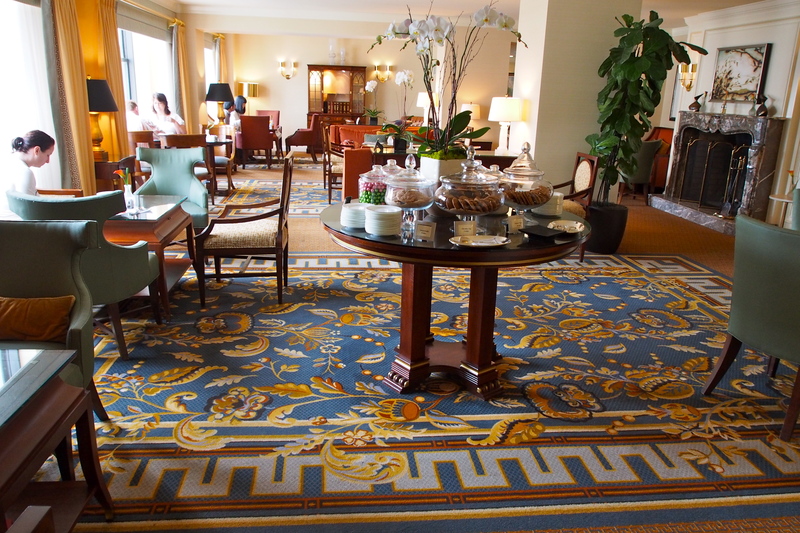 During the day, the Club Lounge is a great place to relax and enjoy a coffee or soft drink. Naturally complimentary internet is available, as are meeting rooms. The Hotel’s main restaurant “Collins Kitchen” is popular with guests and locals alike and has an outstanding buffet breakfast. 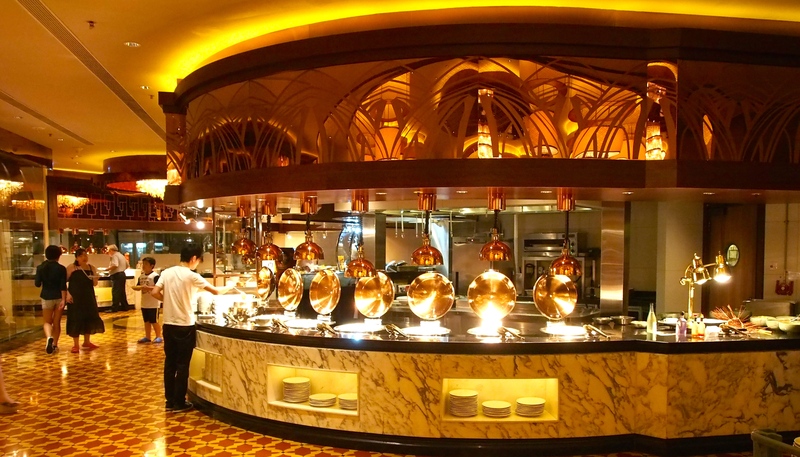 At lunch they offer live cooking stations where guests can interact with the chefs to create their own dishes. A full a la carte menu is also available. We thoroughly enjoyed our stay. 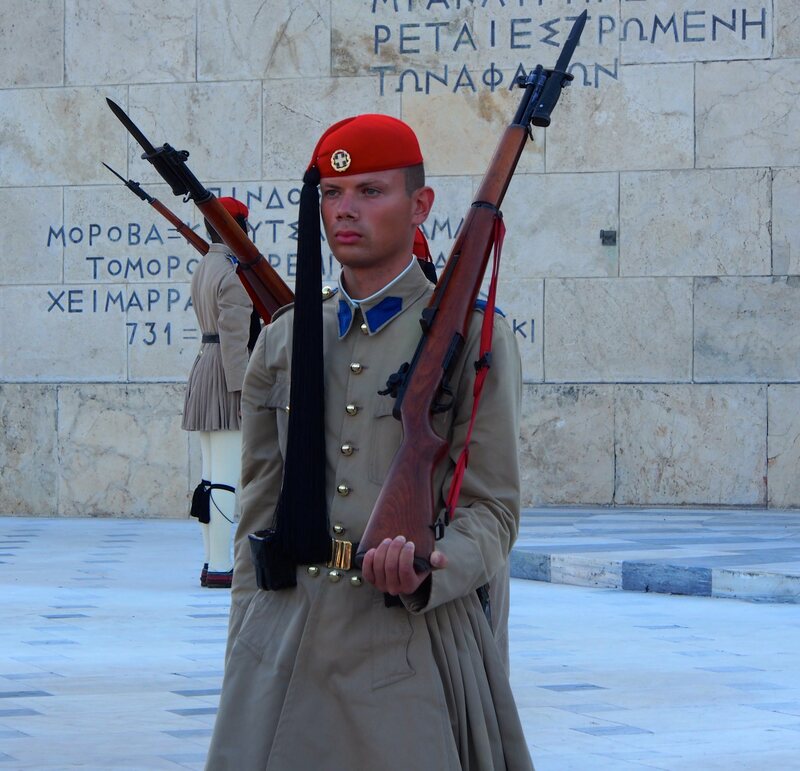 Posted on 21/09/2014	by John Pond, J.P.
A few weeks ago I flew to Athens for several days of sightseeing before joining a cruise in nearby Piraeus. I had not been to Athens before and was pretty excited at the prospect. As is my usual practice, I used Trip Advisor to search for a suitable hotel that fitted my parameters. Location, 5 stars of course and with excellent reviews. Well 2 hotels kept popping up. Hotel Grande Bretagne (A Luxury Collection Hotel) and King George also (A Luxury Collection Hotel). They are part of the Starwood Group, so they had to be good.When staying for several days at a destination, I often book more than one hotel. I love a good hotel and want to experience all it has to offer. As an ex hotel manager, during part of my varied life, hotels hold a fascination. 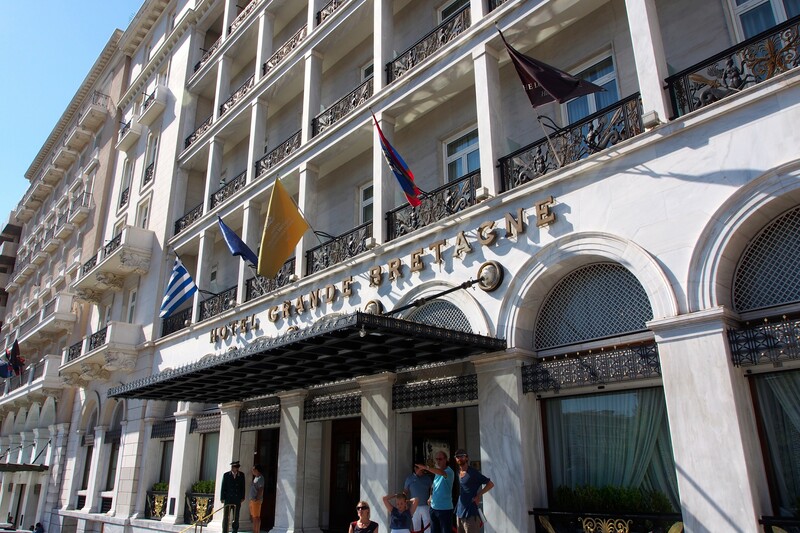 After arriving at Athens airport, a short taxi ride to downtown saw us in front of our elegant hotel, The Grande Bretagne, opposite Parliament and Syntagma Square. Entering the lobby was almost like stepping into a regal palace, intricate moldings and classic décor. After friendly and fast check in we headed to our room, but not before partaking of a complimentary cold drink from a table next to check in. Our room was spacious and elegant with a great view overlooking the Square and Parliament House. Some other rooms looked towards the Acropolis. As one would expect in a 5star hotel, it had all the usual bells and whistles, but it was the ambience and superior service that stood out. Situated a short walk from the best shops and famous Plaka, where hundreds of restaurants offering mainly Greek fare, could be experienced. We ate mainly in the hotel restaurants, but had some traditional meals in the nearby eateries. A highlight each morning was breakfast at the rooftop garden restaurant, which offered panoramic views of the nearby Acropolis. A drink or afternoon tea in the ground floor bar area is a must. This was an outstanding, truly 5 star hotel. One of the world’s best in my opinion. Suggest a view room, either of Parliament or Acropolis. Firstly let me say I love Hawaii and in particular, the Waikiki Beach area. There are so many great hotels to choose from. I have been visiting Hawaii on a regular basis since 1960. Perhaps more than any other hotel, the Outrigger Waikiki keeps calling me back. I have stayed at this hotel probably in excess of 20 times. On a recent business trip I again returned to this, one of my favourite hotels. The Outrigger Waikiki has not changed a lot in all these years and is perhaps one of the most popular hotels on the beachfront. Compared to its neighbours, it is relatively inexpensive, with outstanding views to Diamond Head. 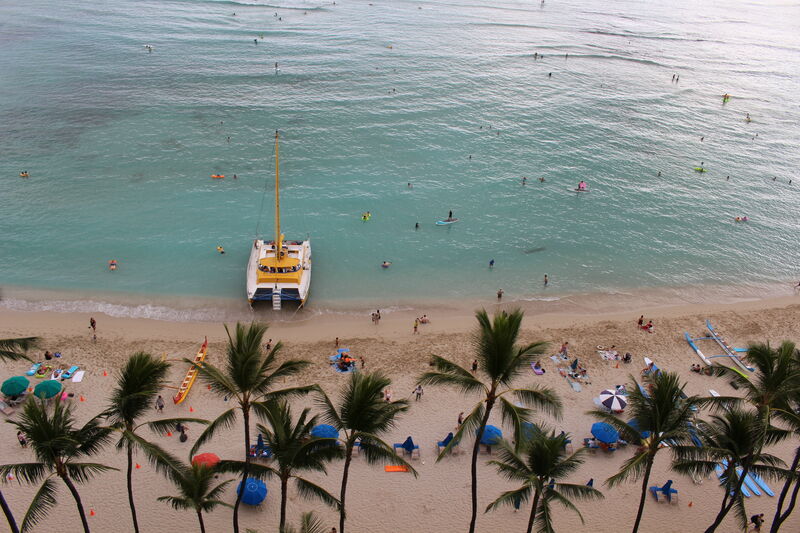 The city view rooms are less expensive but why go to Waikiki and not take advantage of the beachfront view. The view from the balcony made one understand why a beachfront hotel is a must, forget the slight additional cost. The décor was still very much in a time warp of “Hawaii Sixties” but this did not worry me at all, as I almost preferred it to the more generic modern hotels. Staff were very efficient and helpful. 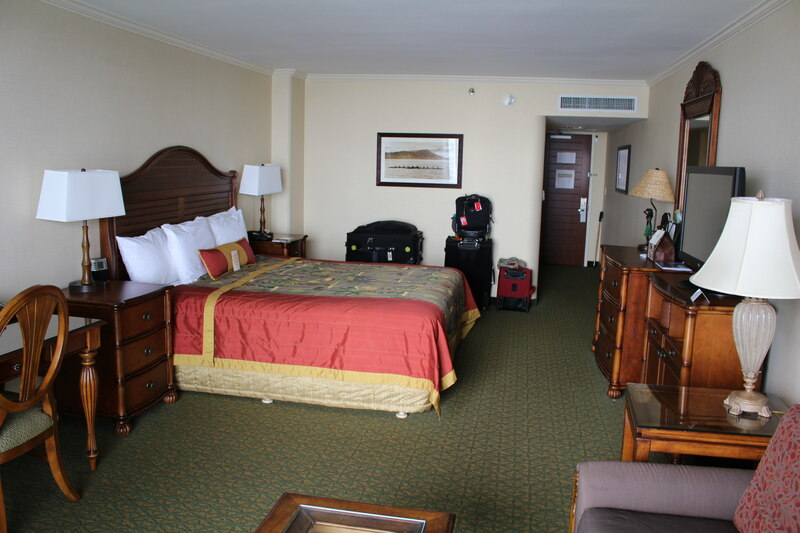 Our room was clean, spacious and with all the expected appointments including free wi-fi. The room was furnished with dark heavy wooden furniture, that I would like to see made lighter, for a more tropical feel. The hotel’s pool is right on the edge of the beach. 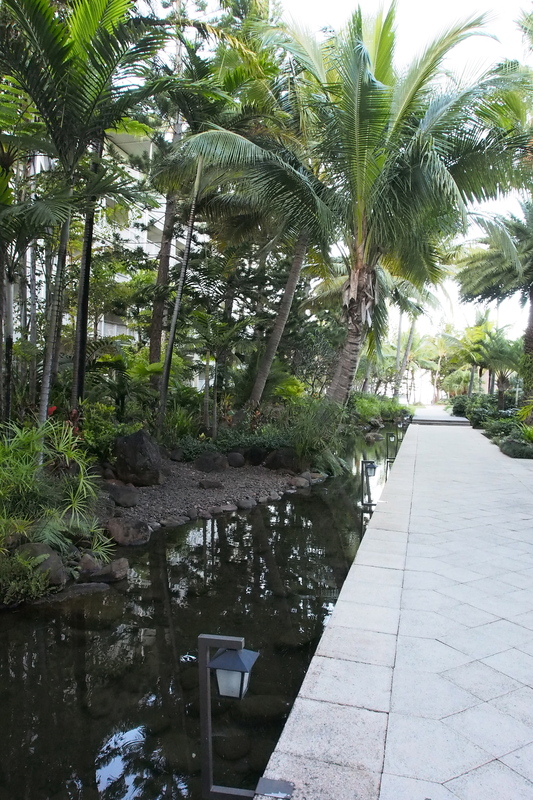 The location was perfect, right in the middle of the Waikiki shopping and restaurant area, great for an evening stroll. Buses at the door to Al a Moana Shopping Centre and also to the Outlet Centre. A favourite store, almost opposite, was Macys which was great for late night shopping . The hotel boasted two very popular restaurants, the more casual Dukes and the Hula Grill, there was live music at each venue. This four star hotel is very popular with Australians, who appreciate a good deal and great value. Posted on 31/08/2014	by John Pond, J.P. Recently I was in Honolulu for several weeks on a business trip. 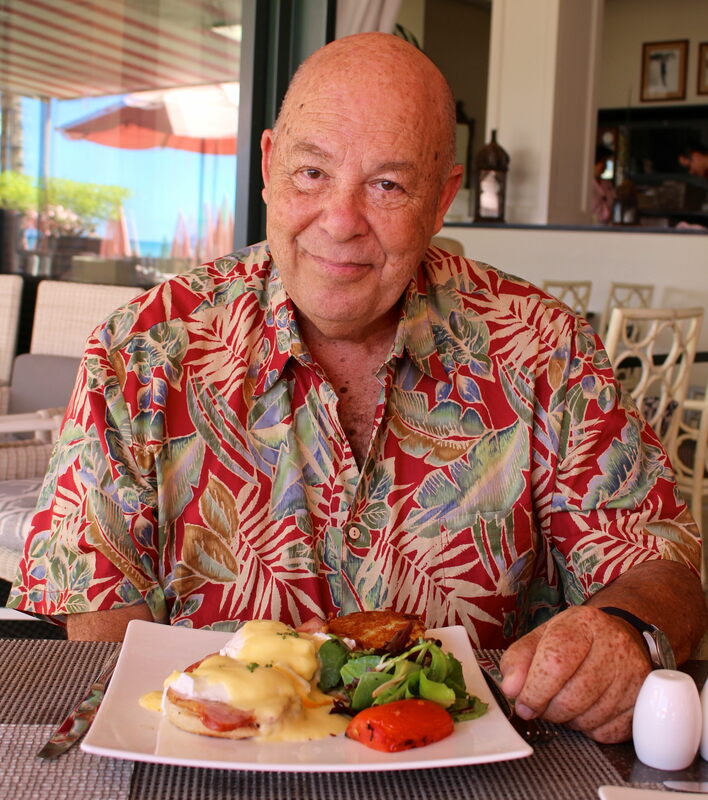 For most of my visit I was accommodated in beachfront Waikiki properties, but as my stay grew to an end, I felt I deserved a few days of relaxation at one of Hawaii’s best resorts. 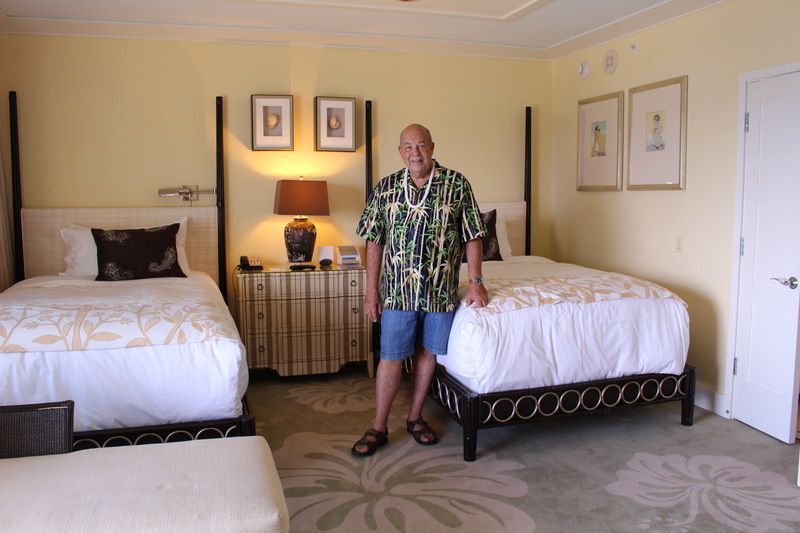 I had previously stayed at The Kahala over 25 years ago. It was like being on an outer island resort, but literally ten minutes cab ride from Waikiki, so I booked three nights at The Kahala Resort to end our Hawaii stay. On arrival my wife and I did a quick walk around the property and were enticed by The Seaside Grill, situated literally on the private beach where we enjoyed a casual lunch under the palm trees before going back to our room to unpack. The foyer area with its huge chandeliers and high ceilings, takes one back to the elegance of yesteryear. The hotel’s décor throughout the property is tropical casual and just sitting and enjoying one’s surroundings is a pleasure. The hotel offers several dining options. We particularly enjoyed having high tea on the Verandah deck one afternoon. Each morning we ate our buffet breakfast from the huge selection of items available (including great crepes) in the Plumeria Beach House. The made to order egg white omelette and the Eggs Benedict were a favourite. All the usual amenities one would expect in a five star hotel are on hand. The Japanese Toto toilets with built in bidets and many gadgets, were most welcome. Rooms range in price from around $440 to $12,000 for the 2 bedroom Imperial Suite. Our room had the highest beds we have ever seen, almost needed a ladder to climb into bed, but very comfortable. The Dolphin pool/lake area, is home to 5 bottle nosed dolphins; one can pay a fee to swim with the dolphins, under the strict supervision of a marine biologist. Feeding the dolphins is also a popular option. This has enabled the resort to donate millions of dollars to help dolphins and other marine life. Although we did not take these options, we had an enjoyable time watching others participate. The dolphins appeared to be having as much fun as the guests. 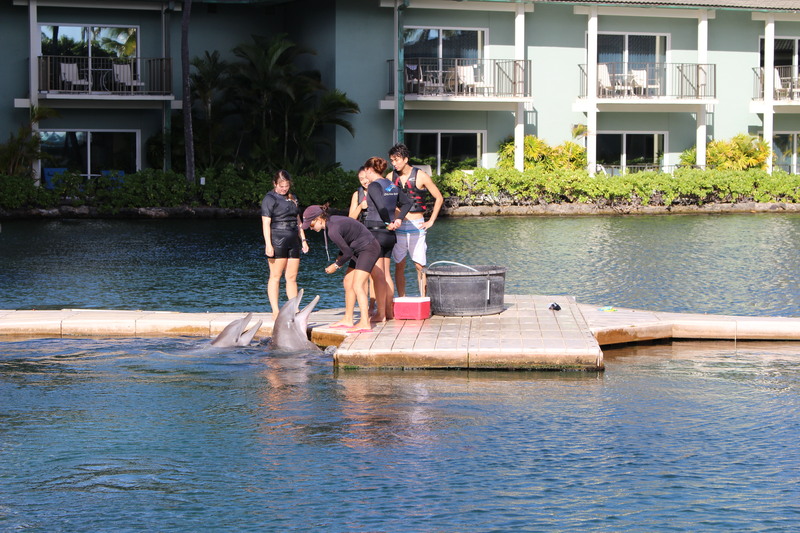 The number of interactions with the dolphins is carefully monitored. Every inch of the spacious grounds adds to ones enjoyment and relaxation. Overall, although it had been many years since I had been to this very elegant property, I was still impressed. Service, room quality and overall ambience was still very much five star. When only the very best will do. Posted on 11/05/2014	by John Pond, J.P. I am an Australian who recently stayed a month in the Waikiki area. Most of the time was spent in 5 star hotels. I try to visit Hawaii annually as quite honestly I love the place. I had always been impressed by the Aston Waikiki Beach Tower due to its excellent position opposite Waikiki Beach and right in the middle of the restaurant and shopping precinct. 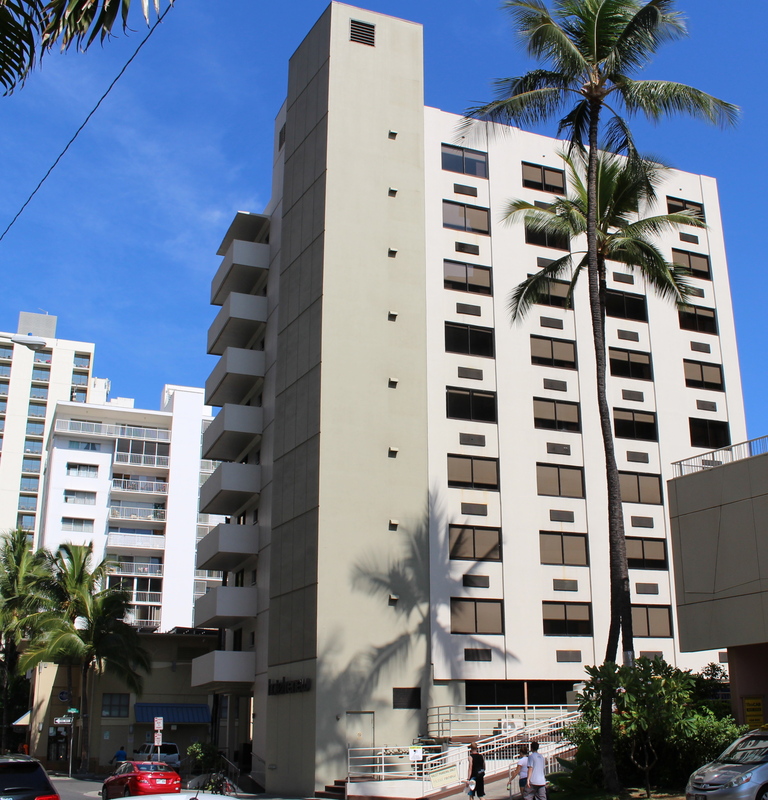 On my last trip I decided to spend a few nights there and check out the differences between Waikiki apartment living and 5 star hotels. The check in process was as we expected from any 5 star hotel and it was very pleasant to be escorted to our room by an Assistant Manager who pointed out the features of the apartment. Our two bedroom apartment had a large lounge dining area that led on to a very spacious balcony complete with outdoor furniture. The fully fitted out kitchen boasted a full size refrigerator, dishwasher, microwave, oven and cooktop plus many other culinary accessories. The drawers were stocked with plates, glasses, pots & pans, cutlery and all the utensils necessary. Although my wife and I don’t do much cooking while on vacation, it was very pleasant to be able to stock up the fridge with breakfast and snack items. An excellent washing machine, clothes dryer and iron proved to be very handy. The bathroom had all the facilities and to our delight had the wonderful Japanese style toilet with the built in bidet and seat warmer. The ever present ABC convenience store that seems to stock everything, was next door and a full sized supermarket was in the block behind. There was a pool area which we did not use as the beach was a thirty second walk across the road. Staff were very helpful and explained how to use the free internet and cable HBO movie box. The apartment was serviced twice daily and was spotlessly clean. Although there were only two of us, these extremely large apartments would be most suitable for families, as extra bedding can be provided if required for larger families. The extremely big TVs in the lounge and bedrooms, especially with their cable capability, was a big plus to me. For the cost of staying at a 5 star hotel in a single room, one may enjoy the pleasures of spacious apartment living with all it has to offer. The views overlooking Waikiki Beach and Diamond Head were exceptional and I certainly look forward to staying at this apartment hotel again in the near future. Posted on 27/02/2014	by John Pond, J.P.
Sheraton Waikiki. 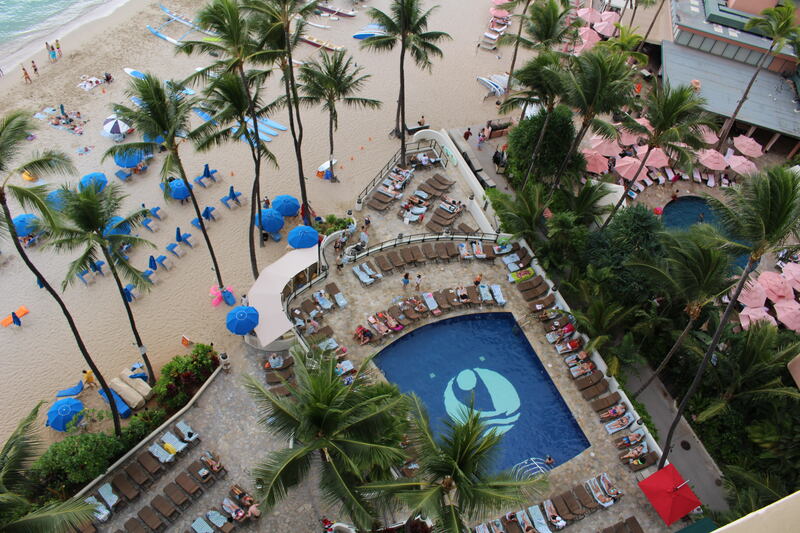 It’s been several years since I have stayed at the Sheraton Waikiki, perhaps the largest 4-5 star hotel on Oahu. 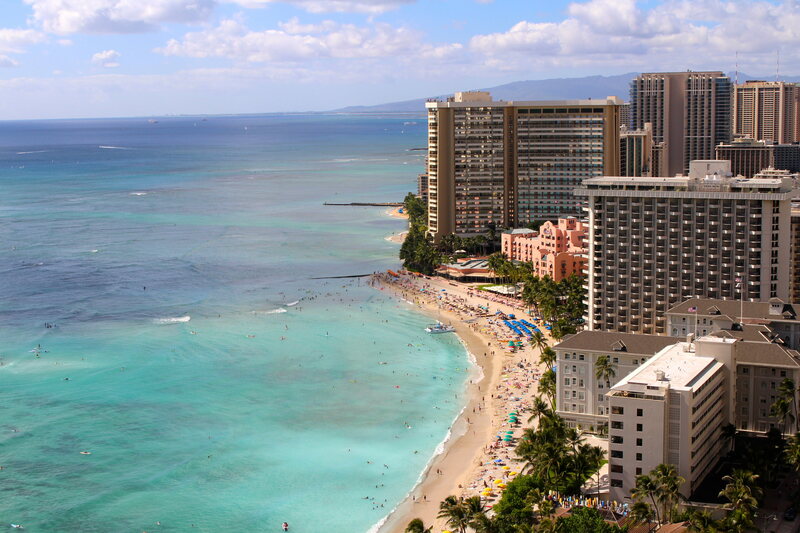 This 1000+ room hotel dominates the Waikiki beach skyline. Our room on the hotel’s 29th floor situated on the wing overlooking Diamond Head gave perhaps the finest views of this great landmark, as well as giving excewllent overlooking many of the other major hotels, including the famous “Pink Palace” and Moana Surfrider situated next door. For a 4-5 star hotel the rooms were well laid out and comfortable. The balcony was a good size and a most pleasant place to relax and take in the great scenery. In the early evening, when the sun is setting, the live Polynesian music from the neighbouring hotels wafted to our balcony, making for a very pleasant experience. The property has many shops off the foyer including an excellent convenience store offering a variety of products including fresh fruit and snackfood. This store seemed well patronized throughout the day and evening. There were also top of the line jewellery, clothing, beachwear, chocolate and cookie shops to tempt guests. There were several pool areas, including one with a water slide for children and a new infinity pool that was very popular with guests. 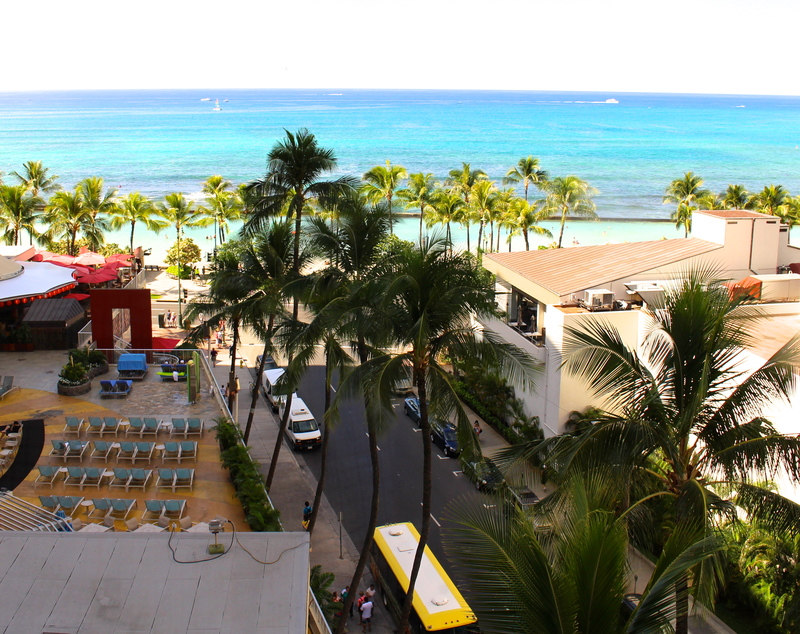 The hotel is well situated on the beach, literally in the heart of the Waikiki shopping precinct. For the young adults, one of the ground floor bars became a very loud disco in the evening, attracting a large following of locals as wells as hotel guests. 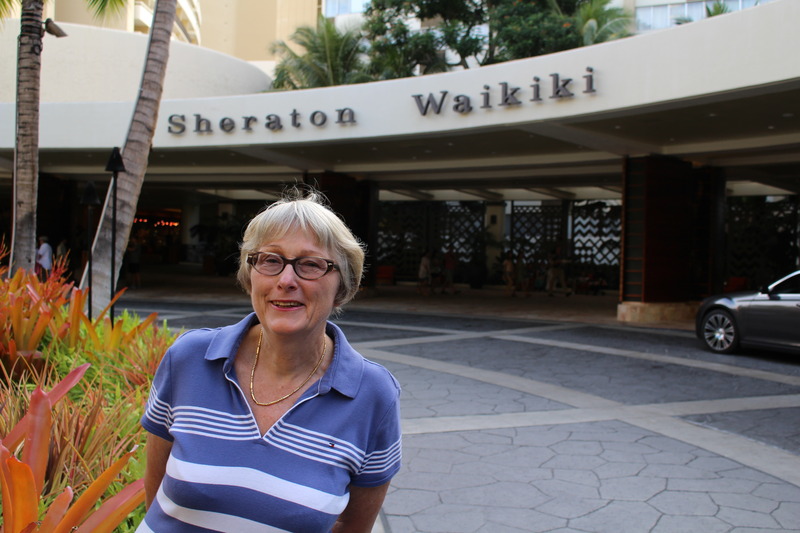 With the exception of one check-in clerk, all staff at the Sheraton Waikiki were very helpful and friendly. 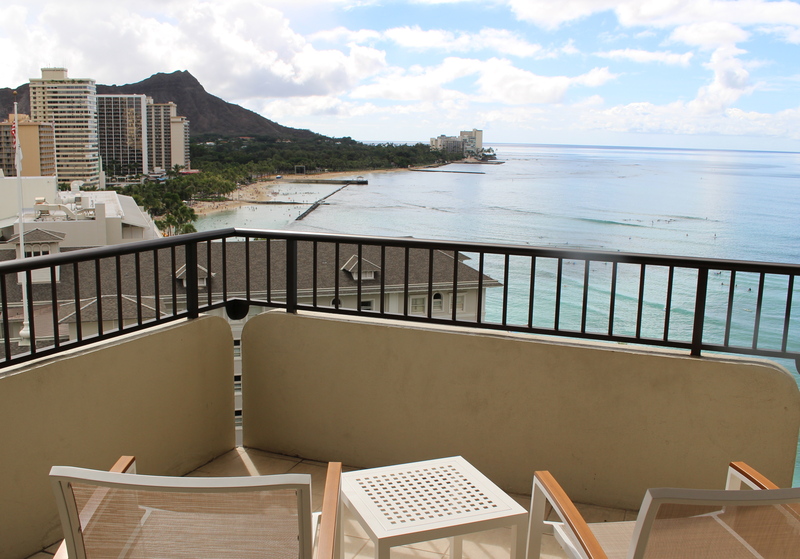 Again I must say, most rooms offer outstanding views of Waikiki Beach and the ocean, especially those rooms situated on the left side of the building, where the views of Diamond Head were absolutely spectacular. I look forward to returning. As, seemingly in all Starwood properties, hand rails in bathrooms and shower areas, make it easy for less mobile and senior guests. Many of the premier properties in Waikiki are owned or operated by Starwood and a big plus is that meals and drinks from any of these properties may be charged to your room at whichever property one is staying at. If your wondering why I have several hotels reviewed in Waikiki, it’s because I usually spend a month there each year and stay at several hotels, that each have something different to offer. Posted on 26/02/2014	by John Pond, J.P.
After a slightly over-long wait at the check-in desk (7 minutes) in which the reception staff did not seem to realize we existed, a smile or nod would have been appreciated, everything then went smoothly. Our room, a corner one in the newer Tower Wing, with two balconies each with views of Diamond Head and the beach, could not have been more perfect. The seemingly oversized room had more than adequate space. The king size bed offered plenty of sleeping space. The room was absolutely spotless and everything looked freshly painted with wonderful appointments, a truly first class room. All the usual amenities and toiletries including a bar fridge that kept things really cold. A welcome addition in the bathroom was the Japanese style Toto bidet seat, with a remote control offering all the bells and whistles. The shower which was in the bath had what is missing in many hotels, a large handrail, which is greatly appreciated as one gets older. There was literally nothing to fault in this wonderful room that I would certainly look forward to return to in the future. The main balcony was very spacious with two comfortable chairs and a usable table. 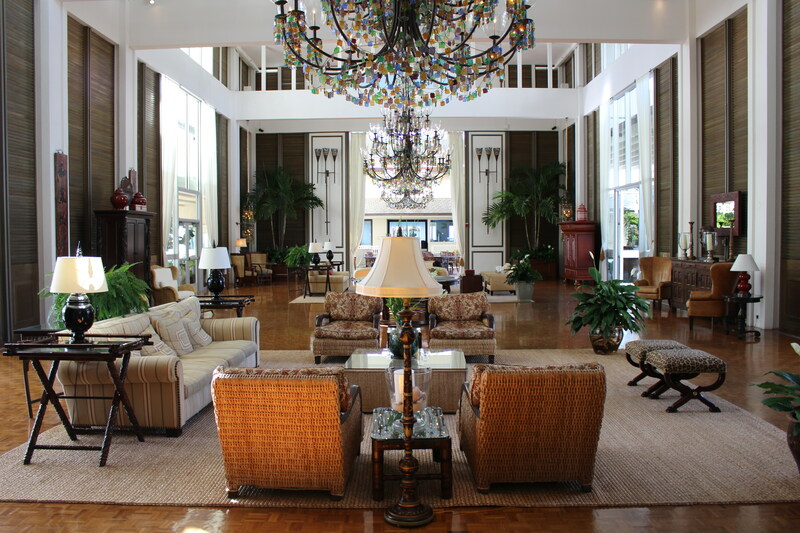 The historic banyan tree off the hotel’s main foyer was a great place for a drink or lunch. The staff were extremely friendly. My wife enjoyed a fish taco and I had a burger. The hotel’s verandah fronting the street is lined with a number of wooden rocking chairs that are very popular with guests. Being one of the original Hawaiian hotels, large verandahs abound and we enjoyed our complimentary cocktails, (a voucher was given to us on arrival) while listening to live music played under the banyan tree. There is a historic tour several days a week which I recommend. For those wishing to soak up the ambience of old Hawaii with all the comforts of a luxury hotel, the Moana Surfrider is certainly a great choice. There appear to be some rooms in the heritage section without balconies, so if a Diamond Head or beach front view is a must, make sure you request same on booking. Posted on 25/02/2014	by John Pond, J.P. 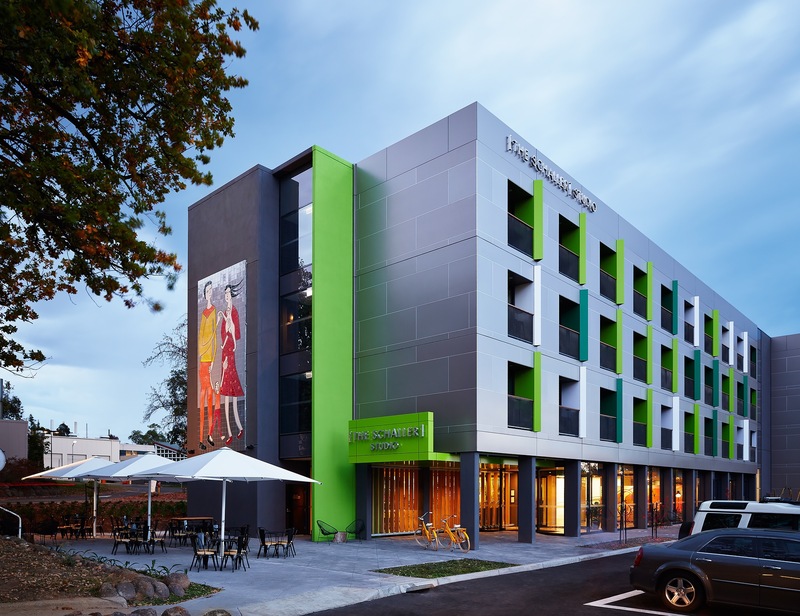 This boutique style hotel was originally I believe a Holiday Inn but has been taken over by Aston and renovated to such a point that it looks like a new property. The rooms appeared brand new and were decorated more in a style one would expect from a European hotel. 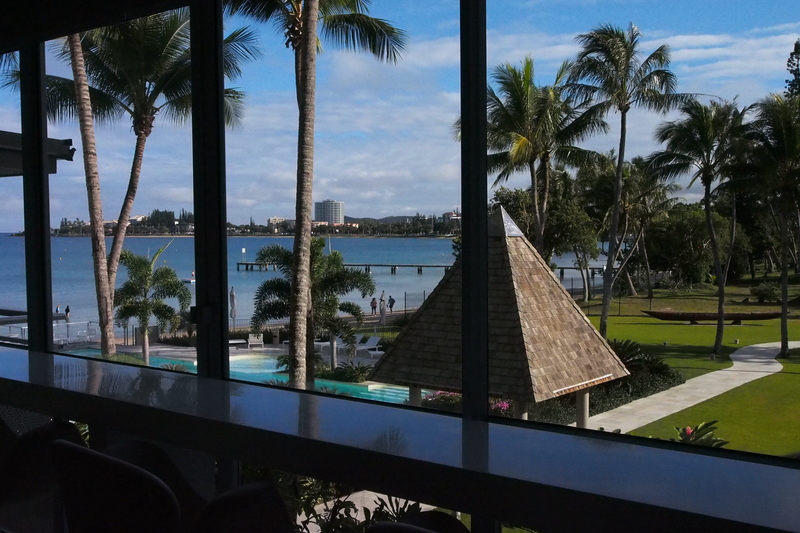 There were no balconies in most of the rooms but a large picture window overlooked Waikiki Beach, less than half a block away. This is a moderately priced hotel offering excellent value and is a real favourite amongst Australians. We were warmly greeted on arrival and offered an ice cold pineapple drink. This is basically a no frills hotel but very comfortable and staff were most willing to please. Complimentary daily newspapers were available in the foyer as was cold lemon water. Each morning a complimentary continental style breakfast was available in the foyer with a limited number of tables and chairs, with most guests taking their coffee, fresh cut fruit and Danish up to their rooms. Bathrooms were a good size with a selection of toiletries. Literally two minutes walk to the sands of Waikiki and many restaurants, this hotel was well positioned. 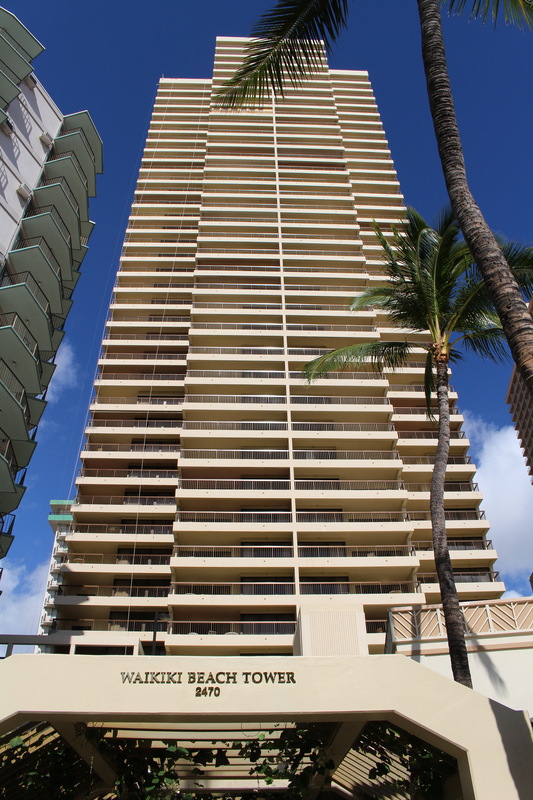 Next door to its big brother, the Aston Waikiki Beach Tower. A big plus was a key card giving access to the poolside and gym facilities of the large Marriott Hotel opposite. A trolley stop is virtually right outside, taking one to the shopping haven of the Ala Moana Shopping Centre, a twenty minute trolley ride away. 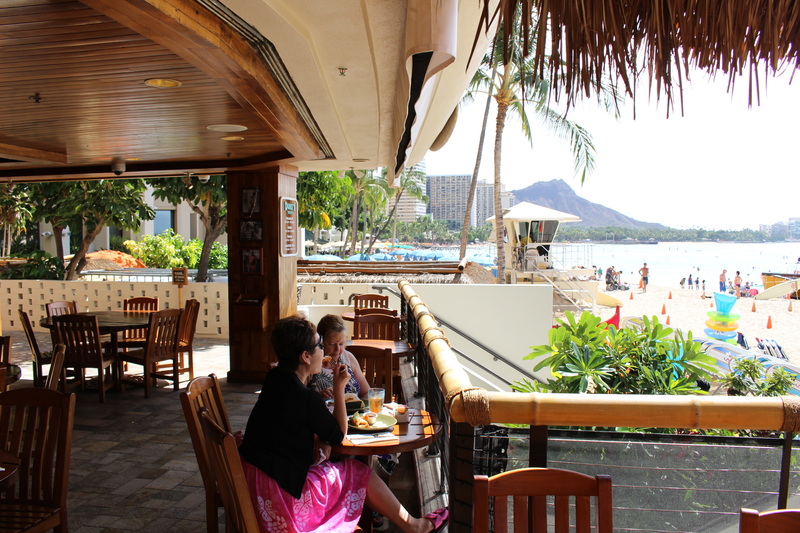 The hotel is situated at the end of the Waikiki strip, towards the Diamond Head end. There was very little to find wrong with this property except their lack of reading lamps by the bed. The rooms were not large but more than adequate for a short stay, or for those just wanting to enjoy the delights of the Waikiki area. The bar fridge was a welcome addition as was the pod coffee maker. 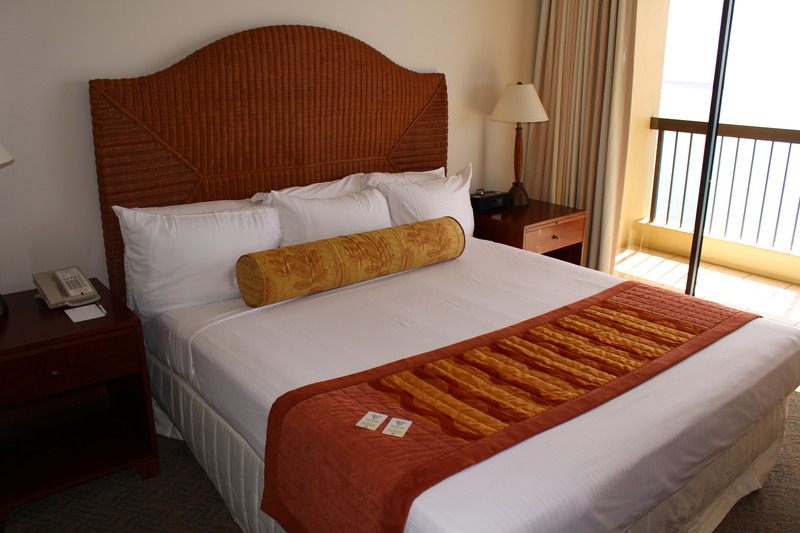 All Hawaiian hotels seem to have added a new tax, called an Amenity Tax, around $15 per night. This usually includes free internet, which somehow does not seem free when you are paying an Amenity Tax. For those that have not been to Waikiki before, there are a plethora of convenience stores called ABC selling everything one could possibly want from beach wear to beverages, both alcoholic and soft and every kind of high quality snack food from sandwiches to fresh fruit. One of these stores is situated virtually next door and most people pop in every day. Posted on 30/01/2014	by John Pond, J.P. I think in reviewing this classic hotel it is important to know a little of this landmark’s history. The Royal Hawaiian opened on February 1, 1927. The then six-storey, 400-room structure was fashioned in a Spanish-Moorish style, popular during the period and influenced by screen star Rudolph Valentino. 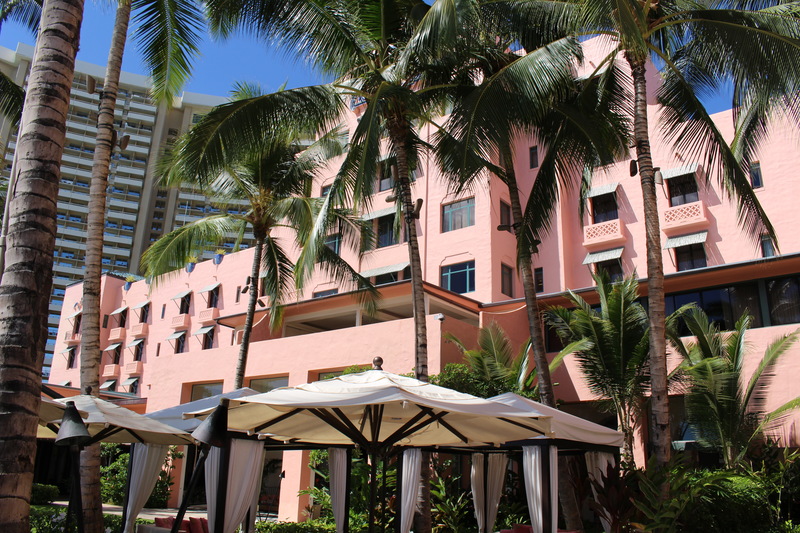 The Honolulu Star-Bulletin described the newly opened Royal Hawaiian as “the first resort hostelry in America”. Set on ten acres of prime Waikiki beachfront, the hotel’s site boasts a majestic lineage having been used as a playground for King Kamehameha after he conquered the island of Oahu. The Royal Hawaiian Hotel was built as a luxury resort for Matson Cruise Line passengers, before the advent of air travel across the Pacific, the only means of reaching Hawaii was a minimum five day sea voyage from the US mainland. Child actress Shirley Temple created a stir by strumming the ukulele on Waikiki Beach when she visited the Royal in the 1930s. In January 1942, the hotel was taken over by the United States Navy as a rest and recreation center for those serving in the Pacific Fleet. The Royal Hawaiian was re-opened to the public in February 1947 after a nearly $2 million renovation. 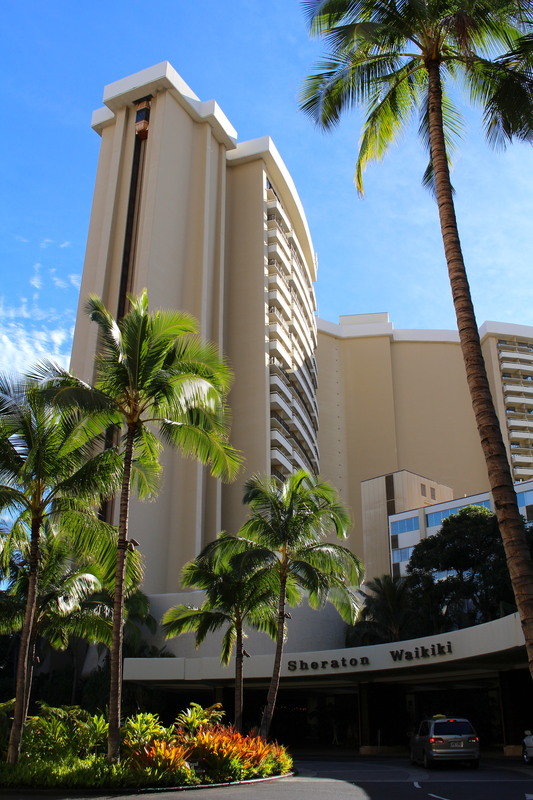 In 1959 ITT Sheraton purchased The Royal Hawaiian from Matson. The Royal Tower Wing was added in 1969 and then sold to Kyo-ya Company, Ltd., with Starwood Hotels & Resorts operating it under a long-term management contract. My wife and I spent a few days at The Royal Hawaiian on a recent Hawaiian vacation. I’ve always had a soft spot for what many affectionately call “The Pink Palace”. On arrival we received a very warm welcome, with the traditional lei and a glass of their signature Pink Lemonade. We were seated at a desk for our check-in formalities, which made for a comfortable start. The hotel consists of the original building and a newer tower. The majority of rooms in the original building do not have balconies. 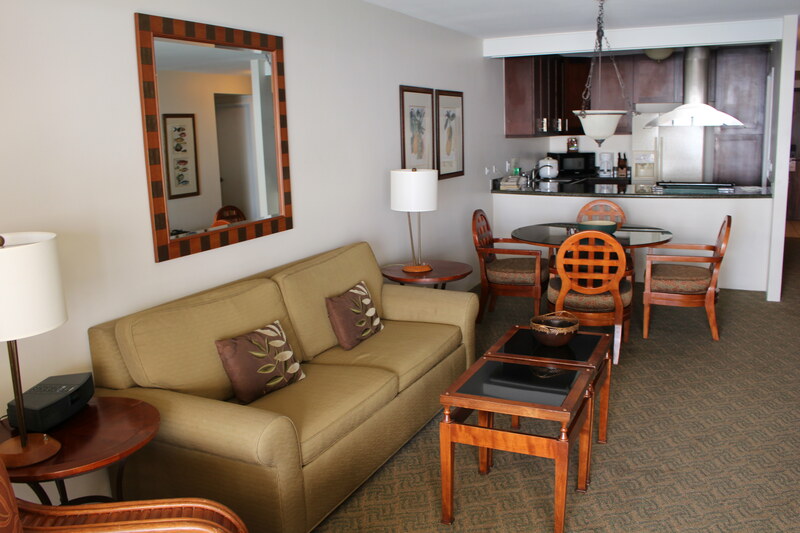 We always choose to stay in the more modern tower in which, I believe, the rooms are larger and all possess spacious balconies overlooking Waikiki Beach. Our room also had outstanding views to Diamond Head. The additional cost for rooms with a premium view is well worth it. Sitting on the balcony watching the sun go down each evening is a real delight. For some reason the sunsets in Hawaii are never to be forgotten. The rooms and bathrooms, although comfortable and spacious, could perhaps do with a slight modernization. The in room coffee making machine was appreciated, it made a great cup of coffee. Breakfast in the main restaurant, situated literally on the beach, was a most pleasant experience. Their Eggs Benedict must be tried, perhaps one of the best I have ever tasted. The spacious gardens and verandahs located around the property makes for a very relaxing ambience, especially sitting on their rocking chairs. There were several weddings on the lawns which we enjoyed watching during our stay. Their famous Mai Tai Bar in the garden beside the beach is a not to be missed attraction, especially at sunset where guests and locals alike gather to listen to the live Hawaiian band that plays till late. Light snacks were also available. We made several new friends at the Mai Tai Bar. There are several excellent shops in an arcade within the property and the piece de resistance is “Newts” Hawaiian shirt and Panama hat shop located by the garden. More great shops, galleries and restaurants can be found in the Royal Hawaiian Shopping Center that stretches along Kalakaua Avenue which is the main tourist and shopping street in Waikiki. One should consider a stay at this iconic property an experience that you will always remember. Hotel Paradis D’Ouvea – Heaven or Hell? 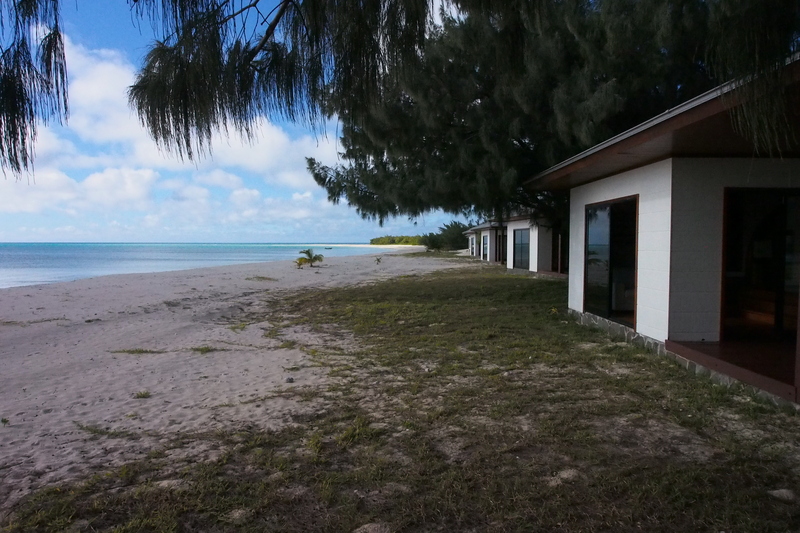 Posted on 06/01/2014	by John Pond, J.P.
Half an hour’s flight from Noumea, (often flights are cancelled or just do not leave) you find yourself in what could be described as a mini-paradise. Unfortunately you quickly realize it is more like hell. We stayed at the best resort on Ouvea (there are no others). On arrival we were greeted with two coconut drinks, this possibly was the highlight of our stay. 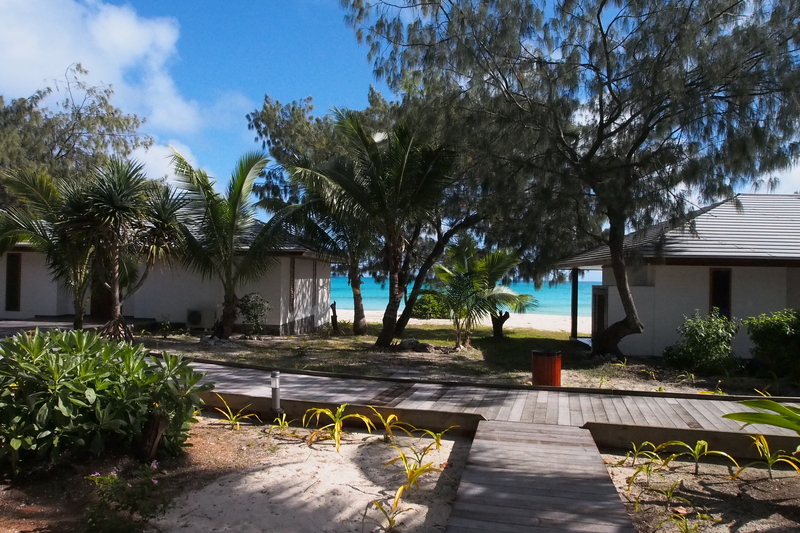 Our accommodation, supposedly the best on offer, was a freestanding one bedroom bungalow, literally right on the beach. There was a large bathroom with a floor level sunken bath that was impossible for anyone but the fittest to access. There were no safety handles, making having a bath for most, impossible. The wall shower was fine, but nowhere to hang a towel. 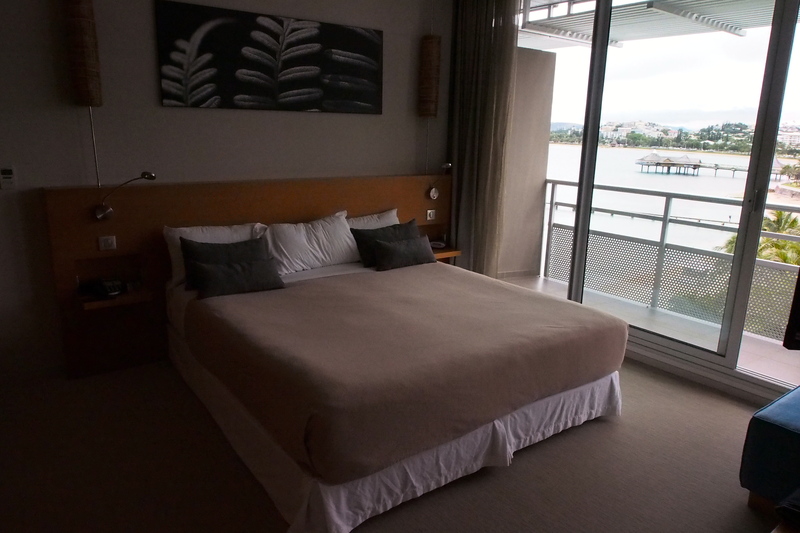 The bedroom and lounge area was very large, with picture windows offering views over the white sand beach. A large terrace off the room was very pleasant to sit and watch the stillness of this tropical paradise. Our only passers by were the dogs roaming the resort. They appeared very friendly, unlike the staff. The resort has a pleasant swimming pool and nice gardens, but the general finishes and surrounds are poor, such as cracked paths and overflowing garbage bins by the front entrance. Our first night’s dinner in the resort’s dining room was, to say the least, disappointing. The large room had about six other diners, the others must have known. The menu was in French and Japanese – too bad if you spoke only English. The only waiter spoke French. Fortunately a Japanese couple at the next table translated for us. For a tropical island, the food was more like European winter hunting lodge. Breakfast was even more of a disappointment. When my wife and I asked the surly waitress, if breakfast had finished, due to the fact there appeared to be no food on display in the buffet area, she managed to say “No American Breakfast” and showed us a plate of bread and pastry, with packaged jams and three tubs of yoghurt – that was it. Now we know why the French are so thin. Rather than go on forever, this resort has enormous potential, if they change their current management and taught the staff about service. Would I go there again – never. Location and accommodation: 4 stars. Service and food: 1 star (I was feeling generous). 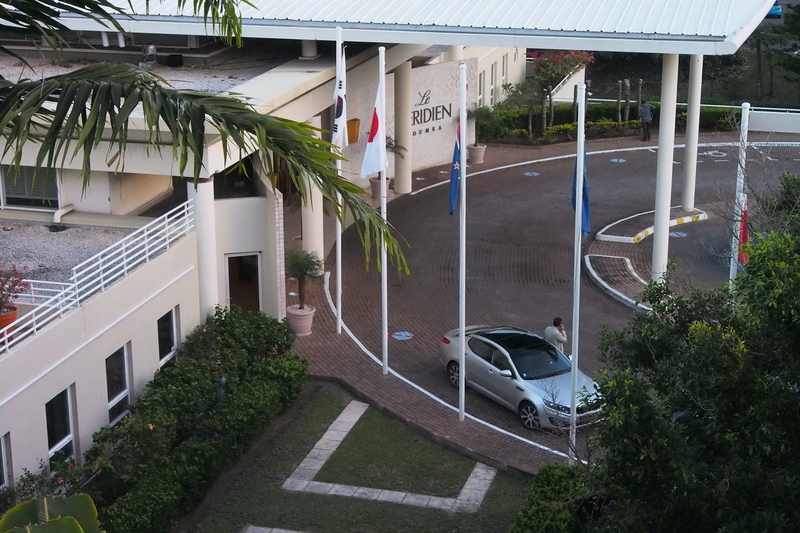 On a recent trip to Noumea we stayed at Le Meridien Hotel. My wife and I decided to spend a few days here and were delighted with our large hotel room with a generous balcony offering sweeping views of the ocean. Although in need of a major refurbishment, the room was very comfortable and clean. We liked the full sized bath with separate shower recess. It was a pleasure to find two fluffy bath robes behind the door. We checked In early evening we were given such a warm welcome by one of the best hotel receptionists we have come across. The property has a feeling of elegance and although as I have said, needs a major refurbishment, this does not distract from its charm. This is a hotel I would happily return to. 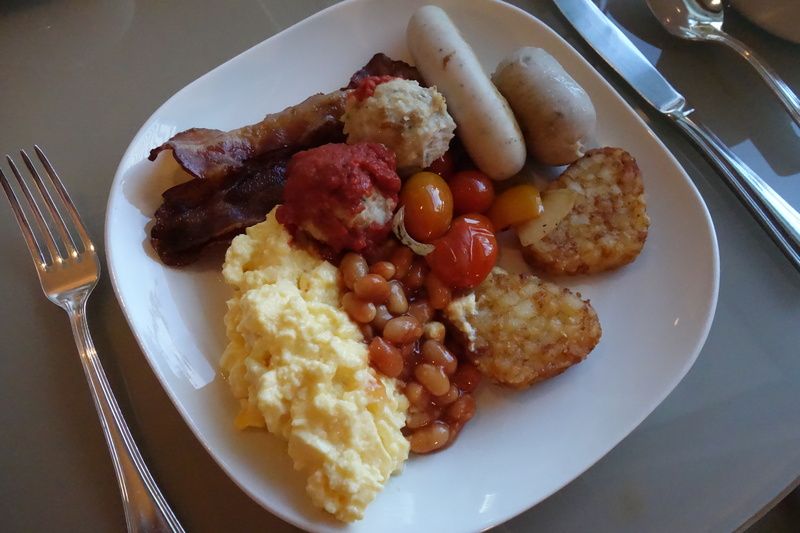 Our package included an excellent buffet breakfast served in a glass walled setting that overlooked the Hotel’s very spacious gardens and pool. LIKES: Well situated, other hotels near by, a short walk to the nearest shops and more restaurants that abound in the Anse Vata area. All the staff we encountered had big smiles and went out of their way to make our stay a most pleasant one. The breakfast buffet was truly outstanding with an abundance of fresh food. The hotel had all the usual facilities one would expect of a 5 star property, although my rating is 4 star due to some of the older fixtures and fittings. Once refurbished, the hotel would definitely rate 5 stars. Perhaps the best hotel in Noumea. DISLIKES: Small screen TVs need replacing. Don’t forget to take European power point adaptors 240V. Posted on 29/09/2013	by John Pond, J.P. Arriving early evening at Noumea’s modern La Tontouta International Airport, we moved quickly through customs and immigration procedures, collected the luggage and went outside the terminal to meet the Arc en Ciel transportation service that was to drive us to the hotel. We had booked and paid for this service on line, prior to leaving Sydney, which streamlined the procedure. We shared the spacious mini-van with others from the plane, but if desired, a private transportation could be booked for a higher fee. The airport is 45kms from the city, so it’s a shame the flight arrives after dark, as you cannot see the beautiful scenery on the way into town. However, I did enjoy the scenic trip on the return journey to the airport. We stayed at the newly opened Chateau Royal Hotel, located on the beach at Anse Vata, set amidst tropical gardens and lawns. Our room, which was actually a two room suite, had a full length balcony that could be accessed from both rooms, and the sweeping views across the bay could be seen from almost every part of the room. There was also a fully equipped kitchen, complete with dishwasher, oven and cooktop along with dinner plates, cups, saucers and cutlery for four people. 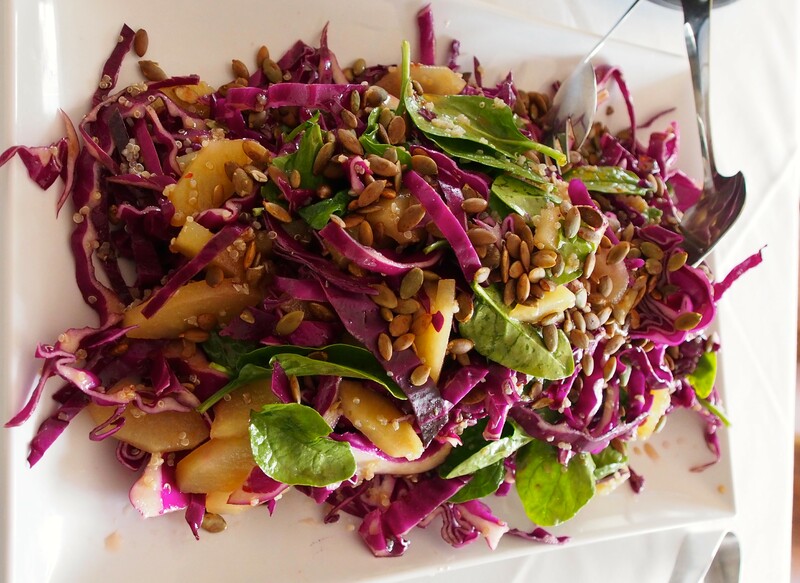 Perfect for those wanting to try their hand at cooking some of the local produce. There was a large flat screen TV in the lounge area as well as the bedroom. The bathroom had a large shower recess but no bathtub. Although the hotel is right on Anse Vata beach, there’s also a large swimming pool, surrounded by palm trees, ideal for relaxing in the sun. The hotel is also famous for their spa, providing massages and every sort of beauty treatment one would expect. With several restaurants and bars, the hotel offers almost everything for a perfect stay. The hotel, in my opinion, is 4 star and offers almost everything for a perfect holiday – except one things – SERVICE. The staff generally seem to be doing you a favour and were certainly more towards 1 or 2 star service. The Reception area was very unwelcoming and we had to wait a lengthy period before being acknowledged each time we went there. Service generally in this hotel left a lot to be desired, but apart from that, we had a pleasant stay. Little to criticise about the hotel, so if your expectations of service are low, you may enjoy your stay. Room Tip: Ask for a view over Anse Vata Bay. Posted on 01/04/2013	by John Pond, J.P.
We stay at different hotels for different reasons. Location is paramount next to hotel amenities and service. One of the best located hotels in Singapore would perhaps be The Fairmont. Situated in the heart of Raffles City, the hotel is literally on top of the Raffles City Shopping Centre, where the hotel has direct access from its foyer, making the sometimes tiring job of shopping a breeze. The shopping centre offers just about every sort of shop one would desire from first class tailors to art galleries and camera and electrical shops. We did most of our Singapore shopping in this centre. 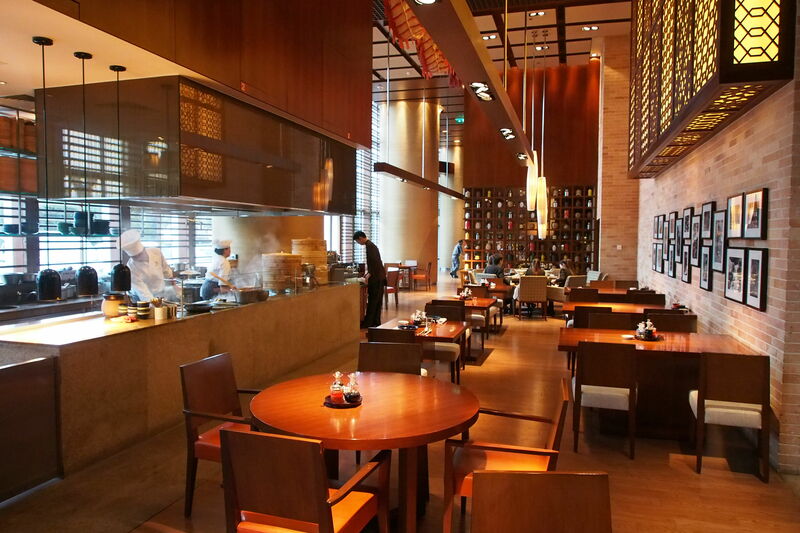 There is a wide variety of food outlets from fast food to fine dining. Another plus is the MRT railway station situated in the shopping centre that enables easy travel within the city. two of Moet and canapés, in the Club Lounge, as we watched the sun go down from their very comfortable seats. 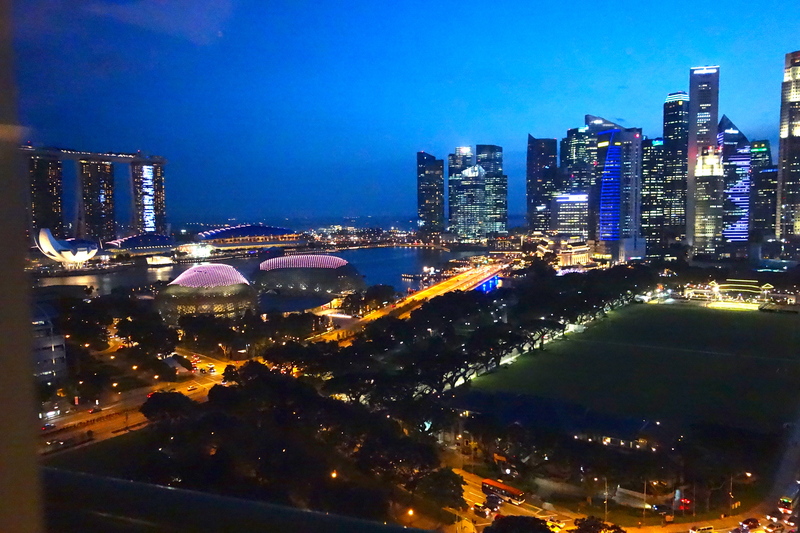 Many of the hotel’s rooms overlook the city and the view at dusk and into the evening is quite stunning. I would suggest asking for a room with a view, as some of the rooms just overlook other hotels. The Club Lounge served an extremely good breakfast and I would highly recommend the additional cost of booking into a Club Floor room. Our hotel room was extremely comfortable and well designed and having an actual balcony that one could step out onto, was a real plus. An added bonus was the pod coffee maker that made excellent coffee and the hotel’s relaxing music CD. The bathroom was spacious, with separate shower and bath. Posted on 31/03/2013	by John Pond, J.P.
As an Australian I am ashamed to say I have not visited Wellington before. The reason for this visit was to spend a few days in this delightful city before boarding a cruise ship for a voyage around New Zealand’s South Island. 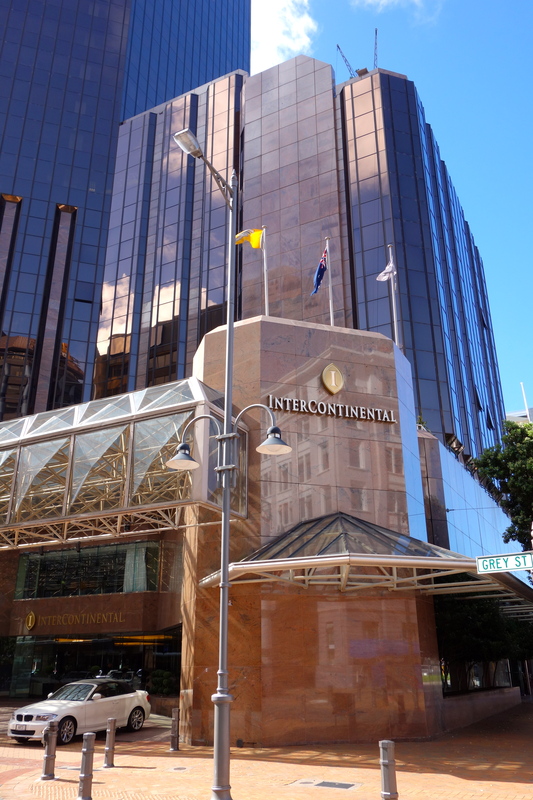 Our flight arrived in Wellington close to midnight and after the quickest deplane and customs clearance, we were on our way by taxi for the short trip to the InterContinental. As our taxi pulled up we were greeted by a charming young lady who quickly took charge of our bags before escorting us to the reception where she checked us in. We were soon in our large room located on the Club Floor level overlooking Wellington Harbour. One of the delights of staying with most InterContinental Hotels is their Club Floor rooms and facilities. My wife and I are almost addicted to Club Lounges. 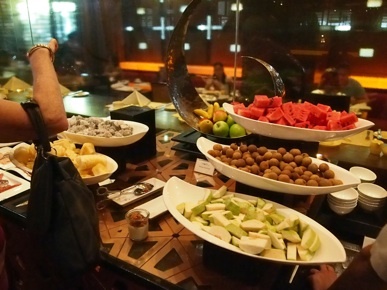 Each evening complimentary drinks, including wine and spirits, were served along with a buffet of substantial finger food, cheeses and more. What a great place to see the sun go down over the harbour and talk to fellow guests. The Hotel’s main restaurant offered an outstanding breakfast buffet as well as a la carte, the local waitstaff were very friendly and informative. For a lighter continental style breakfast, the Club Lounge is the place. 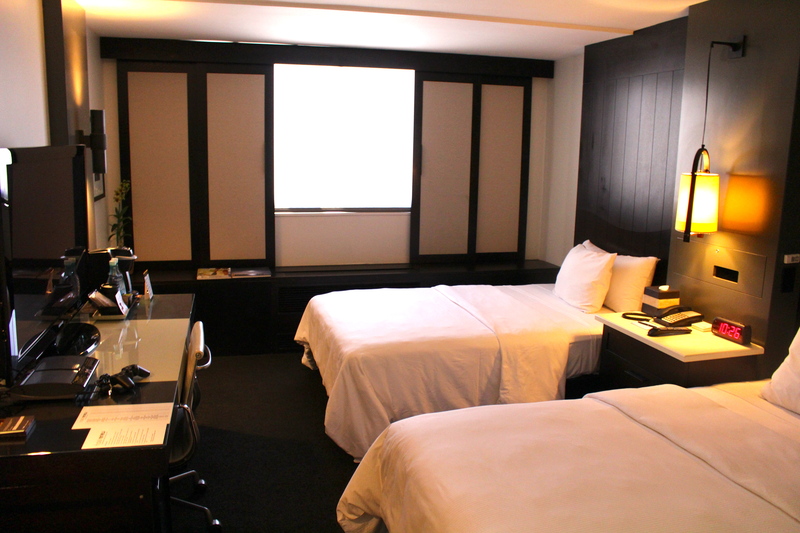 Our room was oversized compared to many hotels and I really enjoyed working at our in-room desk area. The bathroom was spacious, with separate shower recess and a large spa bath in the corner. The foyer lounge was a great place to relax and people watch while sipping a drink or coffee. This harbourside hotel was well situated, close to all the shops and business district. One of the beauties of this town is its size, making it so easy to explore all the surrounding sites. This is a city I look forward to returning soon and my hotel of choice will certainly be the InterContinental, due to its excellent room layouts, friendly service and location. I think one could say, it is certainly the best hotel in town. John Pond. JP & ST interactive sites: www.johnpond.com • johnpondworld.com FaceBook:John Pond undercoverdiners.me John Pond Photo & Camera News • SANDRATBLOG.COM John Pond Reviews Hotels Worldwide BE MY facebook FRIEND CLICK HERE John Pond Circulating to over 5 million travel industry professionals and travelconsumers annually. All John Pond Hotel Reviews are written about hotels that I have personally stayed at and are a result of my observations. Posted on 28/12/2012	by John Pond, J.P. 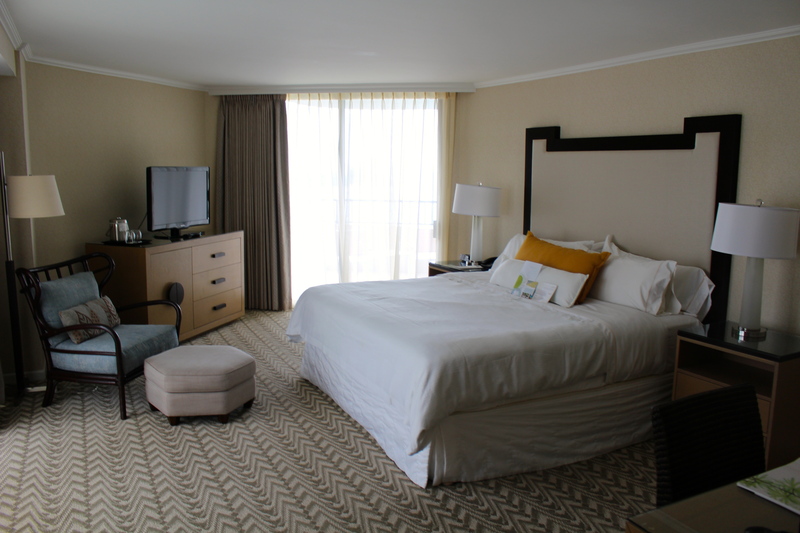 The Four Seasons group of hotels is a favourite, so when we decided to go on our shopping tour of San Francisco, we wanted a hotel that was not only 5 star, but was well situated near the majority of shops in the downtown area. 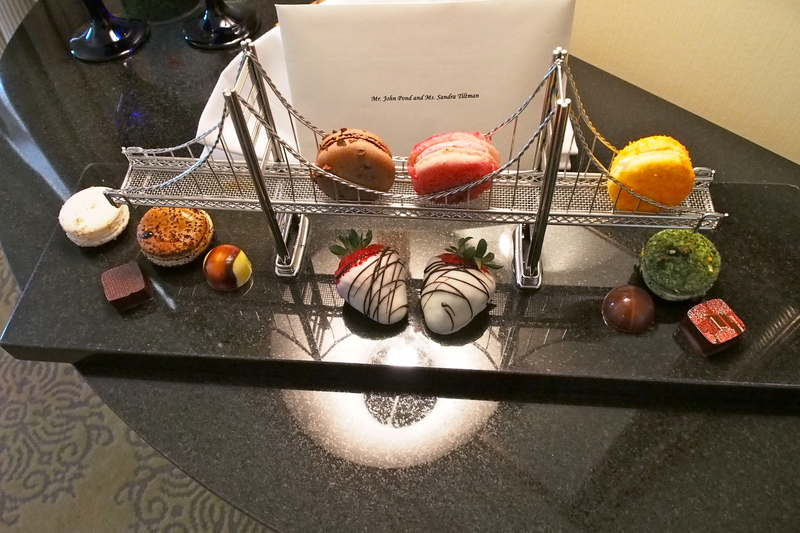 The Four Seasons San Francisco fitted our wish list. Located on Market Street in the flat part of town, we arrived by taxi from the airport (about 25 minutes) and pulled into the car entrance at the rear of the hotel. The reception check in area was on the hotel’s fifth floor and within minutes we were shown to our comfortable room overlooking Market Street. 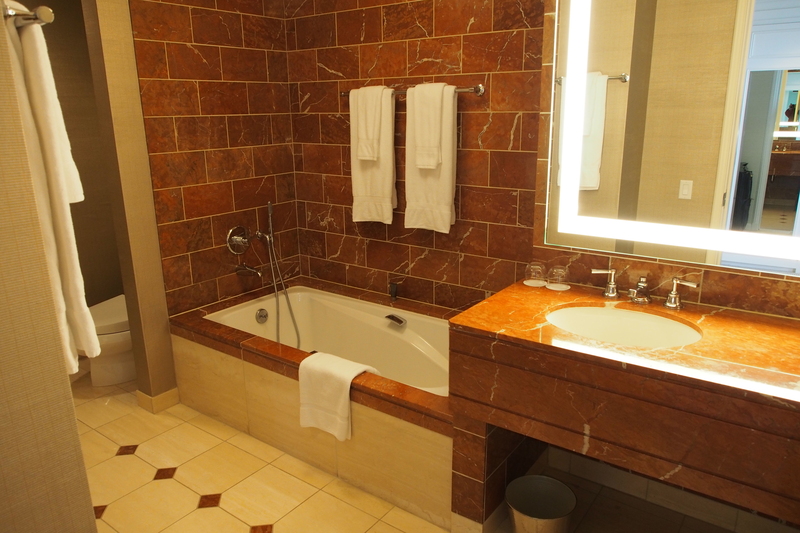 The large bathroom was a plus, with L’Occitane toiletries and king size shower recess, most suitable for older guests. The room had all the luxury amenities one would expect from Four Seasons. The “Seasons” restaurant and bar area was very inviting and we enjoyed an outstanding breakfast each morning (try their waffles and pancakes – exceptional). Seasons is also open for lunch and dinner, where we enjoyed dining one evening during our stay. The steaks, a specialty, were a stand out, Rib Eye 16 oz was $49 + side dishes at an average of $9 per dish. The side dishes added to make the meal one of the most memorable we had experienced in San Francisco, which is known as a foodie town. A short walking distance from the hotel is the, not to be missed, recently renovated Ferry Building with its gourmet restaurants and food shops. San Francisco is famous for its cable cars but one exciting feature for the visitors are the heritage streetcars and trolley buses running a regular passenger service along Market Street called the “F Line”. 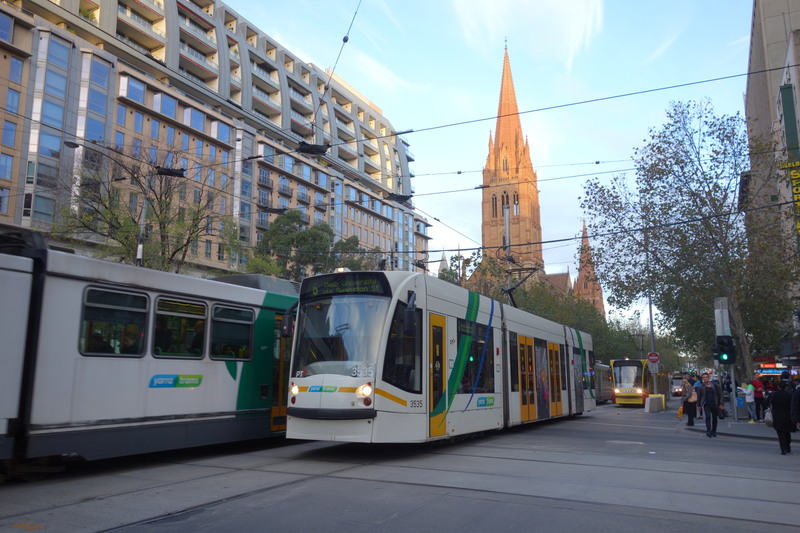 These trams have come from many cities including Milan, Louisville, Brooklyn and Melbourne. 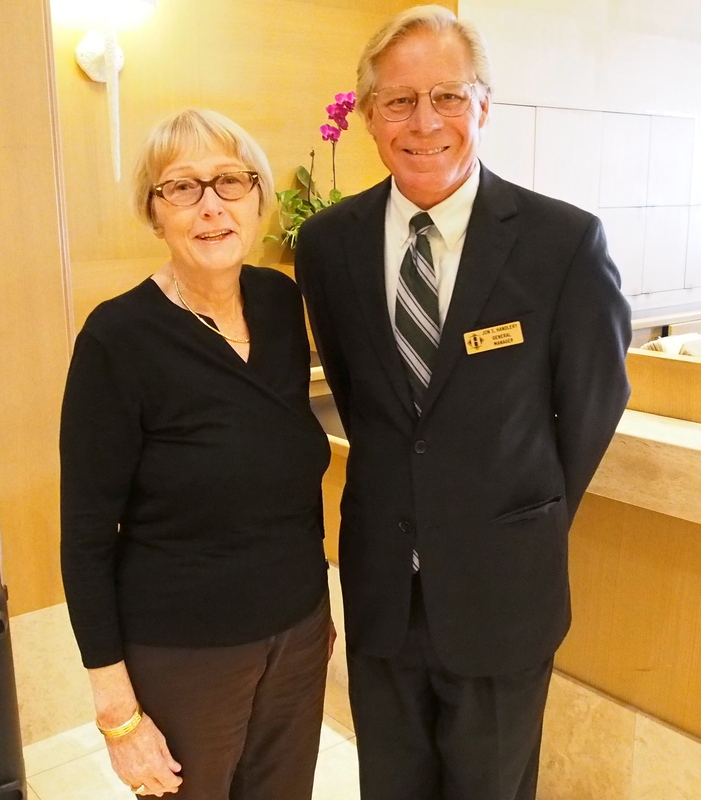 It may be said that John Pond & Sandra Tiltman possibly reach more Cruisers & Travellers in their weekly Cruise & Travel Reports than other travel writers. Published in The Spectator, The Leader and The Times papers and in quarterly magazines, Cruise Passenger, The Retiree and others. Their daily blogs are distributed on facebook, Linkedin, WordPress & MORE. Reaching tens of thousands of consumer and trade readers weekly and millions annually. 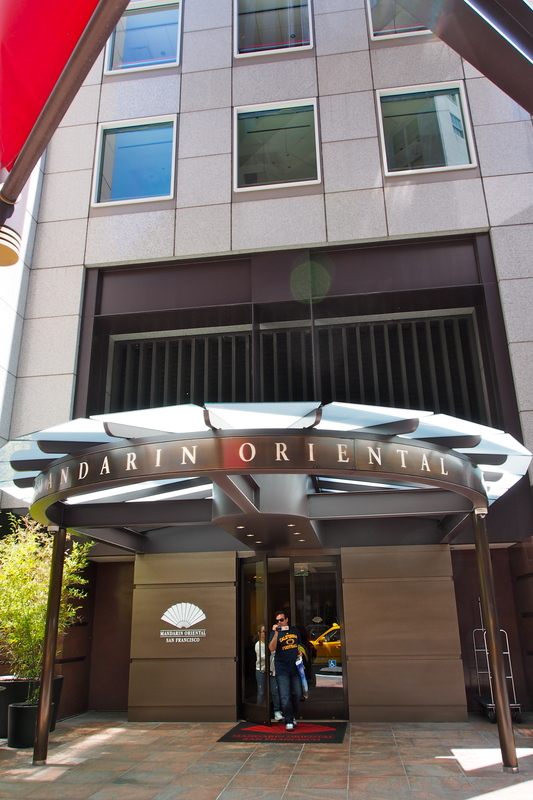 Posted on 21/10/2012	by John Pond, J.P.
A few weeks ago my wife and I stayed at the Mandarin Oriental Hotel, located in San Francisco’s Financial District at 222 Sansome Street. The hotel was a short walk to the shopping district, which was the main reason for our visit; San Francisco is the greatest city to shop for clothes, especially mens. After being pleasantly greeted by a red-coated doorman, the check in procedure took only a few minutes, and we were in our elegant room with its picture windows offering extensive views over the Bay and city. Our room had wonderful views with such great landmarks as Golden Gate Bridge, Coit Tower, the famous Transamerica Building, this hotel has possibly the greatest views on any hotel in San Francisco, I recommend the slight additional cost for a high floor room, the views are worth it. I love a good bathroom and was not disappointed, a large bathtub and separate shower recess, the array of fine toiletries pleased my wife. Apparently the hotel had recently undergone a refurbishment. The room and public areas were in such good taste. 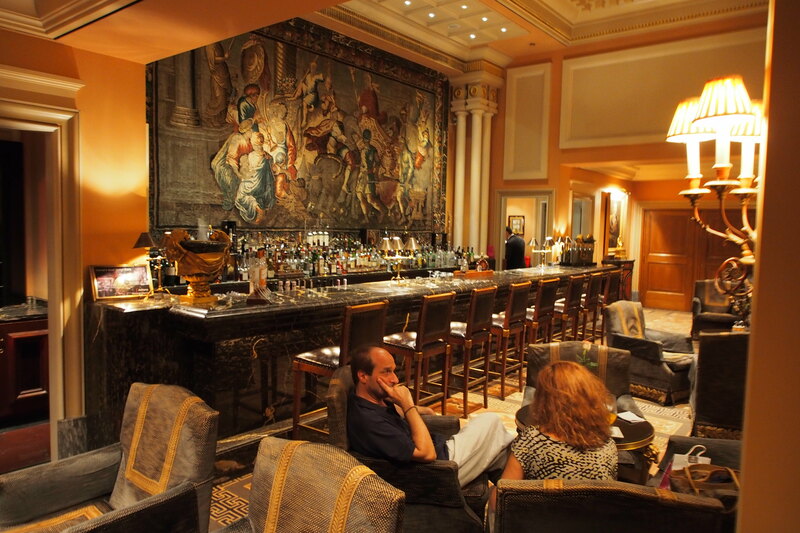 A Brasserie and bar, were off the main lobby where we enjoyed breakfast each day and a fine dinner one evening. I appreciated the hotels location on the flat making for easy walking, especially to the shops at Union Square, not to be missed is the nearby Ferry Terminal Building with its Farmers Market, restaurants and specialty food shops. Posted on 01/09/2012	by John Pond, J.P. Whenever the opportunity arises, I always mention to travelers the many additional benefits they will receive if they decide to book a room on the Club Floor of any hotel which offers its guests such a facility. On a recent visit to San Francisco, my wife Sandra and I decided to take our own advice when I made a booking at the Ritz Carlton Hotel. We discovered this beautiful hotel on a prior visit when I was walking around exploring the prestigious Nob Hill area. I thought the hotel, with its white façade and a bank of pillars, looked so elegant and inviting that on my next visit to San Francisco, this hotel would be where we should stay. The hotel is a low rise building, built in a U shape around a landscaped courtyard and was previously the West Coast headquarters of a New York based insurance company. After pulling up at the imposing entry and admiring the spacious foyer with its inviting lounge and bar areas, the registration formalities completed, we were shown to the Ritz-Carlton Club Level where our corner suite room was located. Because our accommodation was on the Club Level we had automatic access to all the facilities available in the Club Lounge. The Club Lounge offers guests a relaxed and comfortable haven, with plenty of sofas and armchairs to sit back and enjoy reading a magazine, have a coffee, a glass of wine or a cocktail. A very substantial complimentary breakfast is available each morning, followed by mid morning pastries and cakes before the lunch selection of salads, soup, sandwiches and cold meats is displayed to tempt you. It does not stop there. Afternoon tea with beautiful cakes accompanied by tea and coffee then the day is rounded off with wines and cocktails made to order, hors d’oeuvres, savoury treats and sweets. We virtually spent the whole day in the Club Lounge trying all this fabulous food. If that isn’t enough, there is a round table displaying glass bottles of chocolate treats and meringues for guests to help themselves. All of this is included when you are staying in a Ritz-Carlton Club room. The Concierge, located at the entrance to the Club Lounge, was extremely helpful and was able to provide answers to all our questions on where to go in San Francisco. We were also able to complete our check out procedures with ease in the Club Lounge. Our spacious room, with its traditional style décor and 400 thread count Frette bed linens, had views of Coit Tower, San Francisco Bay and the Financial District. The large Italian marble bathroom, with its double sinks and Bulgari amenities made for easy sharing. Located in a quiet residential neighbourhood in Stockton Street, overlooking the Financial District, near the corner of California Street, the hotel is just a short walk to Union Square with all its tempting shops and department stores, such as Neiman Marcus, Saks Fifth Avenue, Macy’s plus many other boutiques and restaurants. The hotel is within walking distance of many of San Francisco’s famous sites such as Grace Cathedral atop Nob Hill, Chinatown, the Italian area of North Beach with its restaurants and specialty food shops plus Lombard Street, the crookedest street in the world. San Francisco’s famous cable cars run along California Street from their base in Market Street to Van Ness Street. The cable car stop on the corner of Stockton and California Streets is very convenient for Ritz Carlton guests. Posted on 14/08/2012	by John Pond, J.P.
As a regular visitor to San Francisco over the years, I have discovered a hotel that ticks all the boxes for location, friendly service and is moderately priced. The Handlery Hotel is literally one minutes walk to Union Square, Macy’s, where your hotel key card entitles you to 10% off all purchases including those on sale, and all the great shops, department stores and theatres. Off the foyer there is an excellent restaurant, The Daily Grill (not run by the hotel) open all day. Its cosy bar makes one want to linger. The restaurant also provides room service for the Handlery. Situated in the flat part of the city, walking is a breeze. We enjoyed our small suite, “Grandma’s Room”, with it’s own private terrace, kitchen and lounge area. Having stayed at this hotel several times over the past twenty years, we are always made most welcome by their friendly staff. 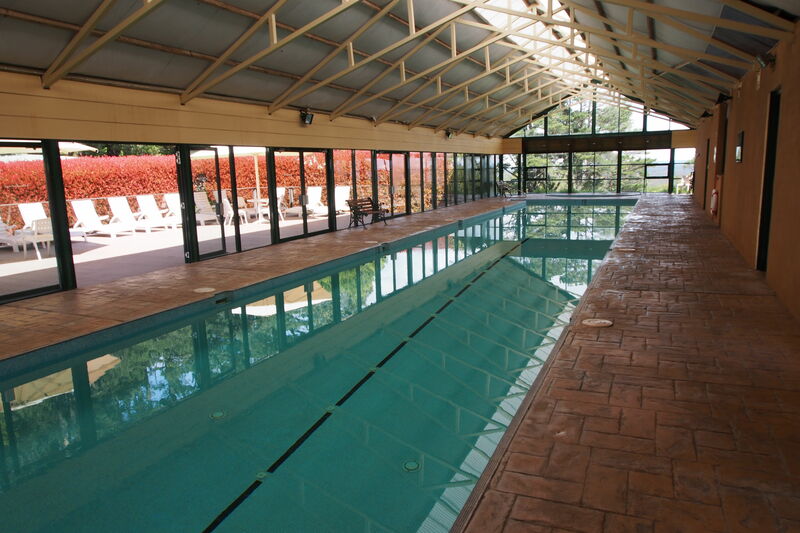 This is a family friendly hotel and is very popular with Australians who like good value and convenient location. There is a pool area, parking and a traditional barber shop. My wife and I always feel very much at home in this hotel. Another plus is its proximity to many different types of restaurants literally minutes walk away. John Pond. JP & ST interactive sites: www.johnpond.com • johnpondworld.com FaceBook:John Pond undercoverdiners.me John Pond Photo & Camera News • SANDRATBLOG.COM John Pond • Hotel Reviews and Events BE MY facebook FRIEND CLICK HERE John Pond Circulating to over 5 million travel industry professionals and travelconsumers annually. All John Pond Hotel Reviews are written about hotels that I have personally stayed at and are a result of my observations. 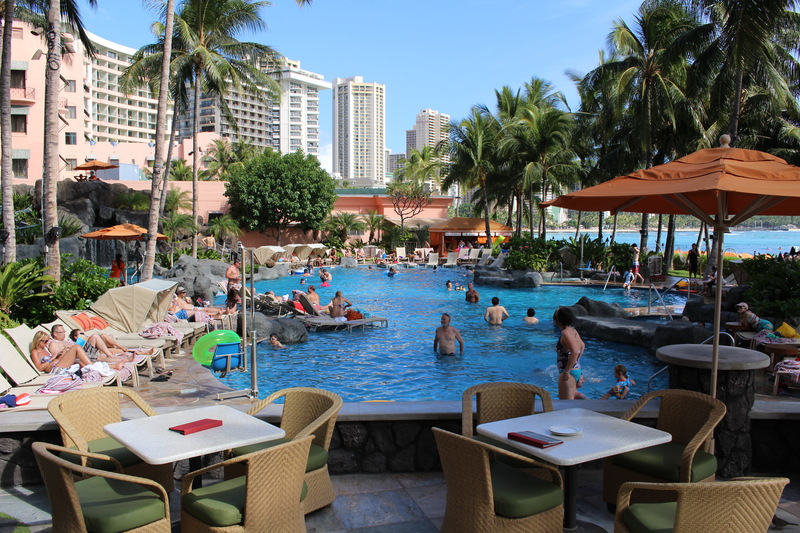 There are many great hotels in Waikiki, the Hyatt Regency is one of my favourites and I have stayed there many times. Hyatt Regency Waikiki Beach Resort and Spa is a vibrant destination combining relaxation and adventure with true Hawaiian hospitality. This 186 roomed hotel is one of New York’s premier luxury hotels – The Benjamin, this hotel attracted me with thier pillow menu. A sleep concierge will help you select from 10 types of pillows for the ultimate night’s sleep. Prices start at around US$389 per night. 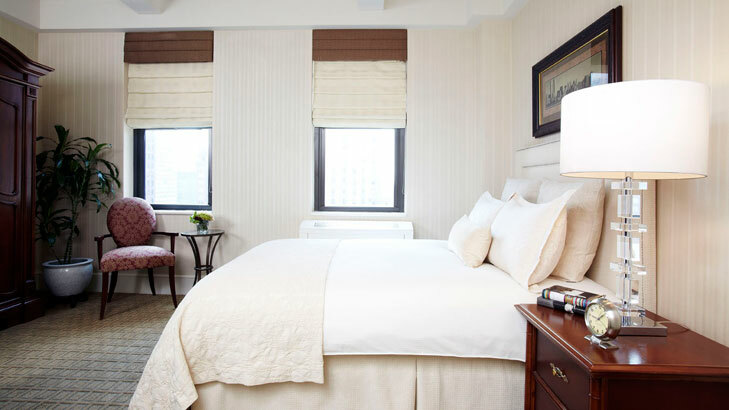 In a classic 1927 building carefully restored to its original grandeur, The Benjamin hotel provides New York City travelers with a warm, intimate atmosphere and the utmost in personal attention. An all Executive Suite Hotel, each room has the custom-designed Benjamin Bed (queen) including 500-thread count Egyptian cotton sheets, a down duvet, luxury Anichini bedding and sleep menu with a 12-Choice Pillow Menu. The rooms also feature a small kitchen galley with a mini refrigerator, iPod alarm clock/radio, HD flat-screen TV, and an executive work desk including a multi-outlet station and high-speed Internet access. I found the hotel charming, well situated and the pillows gave me the best nights sleep. 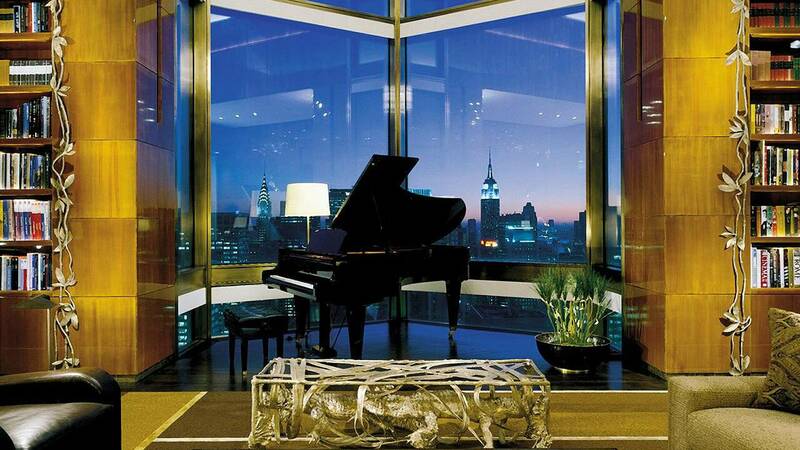 Four Seasons Hotel New York. 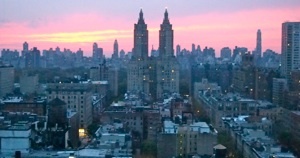 Situated in the heart of Manhattan’s premier shopping and business district, between Park and Madison Avenues, the I.M. Pei-designed Four Seasons features stunning views and gracious style. Staying at this hotel was a remarkable luxury experience, even by New York standards. “One of the finest, great rooms and one of the best bathrooms ever. The huge bath filled in less than a minute. 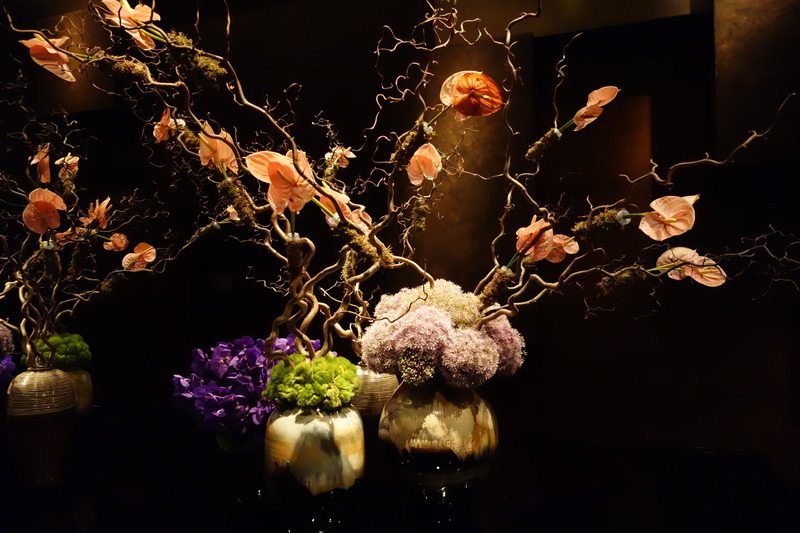 For those wishing the very best, the NY Four Seasons is one of the best hotels in NY”. John Pond. Posted on 13/08/2012	by John Pond, J.P. 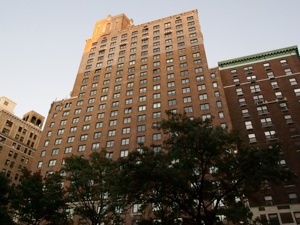 The Hotel Beacon NYC, a haven of comfort amid the bustling excitement of New York City. Located on the historic Upper West Side, amid tree-lined streets and landmark buildings, the hotel is a beacon for relaxation. 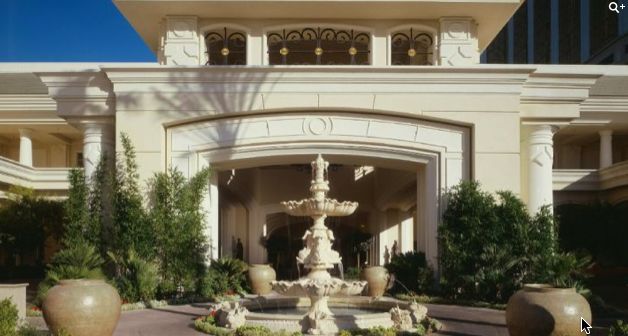 Friendly and accommodating, they offer handsomely decorated, oversized guestrooms and suites. With wonderful views of Central Park, the Hudson River and Midtown Manhattan, the Beacon is the perfect vantage point from which to venture anywhere in New York. And when your busy day is done, you’ll have a perfect place to come home to. The Hotel Beacon NYC is the official hotel of the Beacon Theatre situated next door. Also next door is also a great New York deli, where we ate several times. I love this hotel, in fact I plan to stay there a week on my next visit. Every NY attraction is minutes away by bus or train. The apartment like suites make one feel at home and the market opposite offers every food delight. Although I have stayed at some of the best hotels in the world, this one is a winner for comfort and really feeling at home, but with all the delights of New York at hand. After a cruise on Sea Dream across the Atlantic from Spain, we arrived in Puerto Rico and headed for our hotel the Hotel El Convento in the heart of Old San Juan. To be honest, we were pleasantly surprised. The hotel, originally a convent, was close to just about everything. There were some great 5 star outlet stores and just about everything was a short walk away. I would rate this hotel 4 star with a 5 star experience all around. Circulating to over 5 million travel industry professionals and travelconsumers annually. All John Pond Hotel Reviews are written about hotels that I have personally stayed at and are a result of my observations. 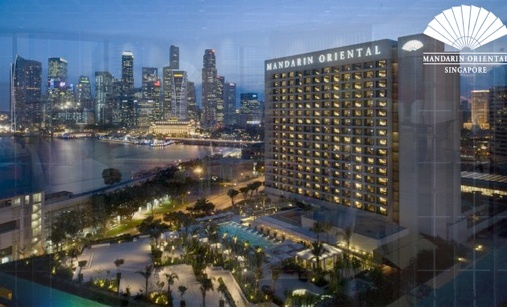 Arriving at the entrance of any luxury 5 star hotel always makes my heart beat a bit faster, but on a recent visit to Singapore, I must admit my heart started to race on entering the Mandarin Oriental Hotel. Whenever I see a hotel offering Club Floor Rooms, I always book that option. I have found from experience that the benefits and extras offered to guests booking these rooms far outweigh the slightly extra tariff. On entering the lobby, as we were booked onto a club floor , we were shown straight to our room, where all the check in formalities were taken care of, while we were offered a cup of hot green tea. The entire process taking only minutes. We then enjoyed relaxing in our elegant room that overlooked Marina Bay. The floor to ceiling wall of glass gave us uninterrupted views. It was not until evening, when all the adjacent tall buildings were aglow, that the full impact of the view came to the fore. Westin Palace, Madrid. Treat yourself royally. Built by order of King Alfonso XIII in 1912, The Westin Palace, Madrid was recently restored to its original splendor. Situated near the Prado museum, historic monuments and some of the best tapas restaurants in town, It is listed in the Condé Nast Traveler “Gold List 2010” as one of the best hotels in Spain. The magnificent building, highlighted by an enormous stained glass dome, has been a centre of spanish society for almost 100 years. The 467 guest rooms and suites are decorated and furnished with stunning marble, precious fabrics and updated with every modern convenience. The Westin Palace is located in the cultural and financial heart of the city, situated in the very center of the “Art Triangle” between the Prado, Thyssen & Reina Sofia museums. Across the road from the Parliament and within walking distance from the Royal Palace and the Opera House, The Westin Palace enjoys a privileged and unique location, it was so pleasant to walk around the streets near the hotel. My wife and I particularly loved the most elegant dining room and the champagne with breakfast. Sandra, my wife and I were whisked from the airport to the Hotel in the hotel’s limo. We ate breakfast and all dinners at the hotel, quite honestly, we did not want to leave the hotel, it had so much to offer. The best breakfast treats, several award winning restaurants. The best views overlooking the city ever. 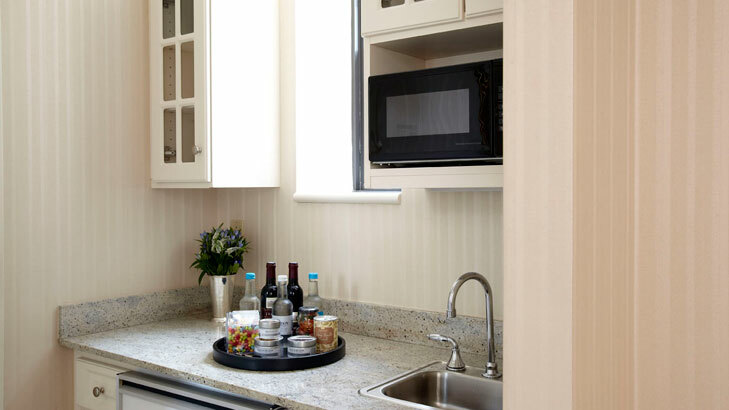 Facilities such as a full kitchen and laundry, everything the traveller could desire. 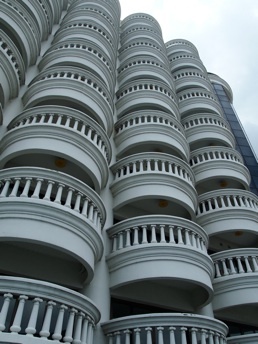 Large balconies, this is one hotel I can’t wait to return to. lebua at State Tower is Bangkok’s finest 5 star all suite hotel. lebua at State Tower is an all-suite hotel where every one of their 137 suites offer vistas of Bangkok and the Chao Phraya river. All guest suites are priced competitively against more traditional sized rooms in five star hotels and offer high speed broadband internet access. All suites provide a lounge and bedroom area, two large screen televisions. Food from Conde Nast Traveler-awarded “The Dome” has special flavour of its own through an extraordinary choice of different cuisines. Luxury City Hotel Thailand | lebua at State Tower Bangkok All John Pond Hotel Reviews are written about hotels that I have personally stayed at and are a result of my observations. 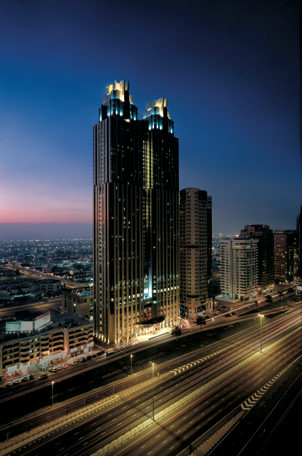 This award-winning Shangri-La Hotel, Dubai, is a luxury hotel that offers luxurious accommodations, exceptional dining and gracious hospitality in the heart of one of the world’s most dynamic cities. Being on a “Club Floor” offers many additional advantages. I fly Emirates very often and as Dubai is their hub, I endeavor to stop off their to break up long flights to Europe. Dubai has many fine hotels and this is one of the best. Sandra, my wife, and I look forward to returning to one of our favourite hotels soon. SEE MORE PHOTOS at www.johnpond.com Australia’s 1st, & oldest independent travel photo website. Burj al Arab DUBAI 7 star self rated ? My wife and I decided to break up our flight from Europe with a couple of nights at the Burj al Arab, rated as the World’s only 7 star hotel. This top of the line hotel appears to be full most of the time, proving there is demand for super luxury, whatever the price. On arrival we were escorted to our two storey suite by an elegant Supervisor who took care of all the check in requirements in our fully equipped office in our suite. We were introduced to our butler, who offered to unpack our bags – what a great start. We climbed the stairs to our enormous bedroom that had floor to ceiling glass walls overlooking Dubai and the Gulf. Words can hardly describe the opulence and comfort of this suite, the only problem was it was so outstanding we hardly left the room, sorry suite.